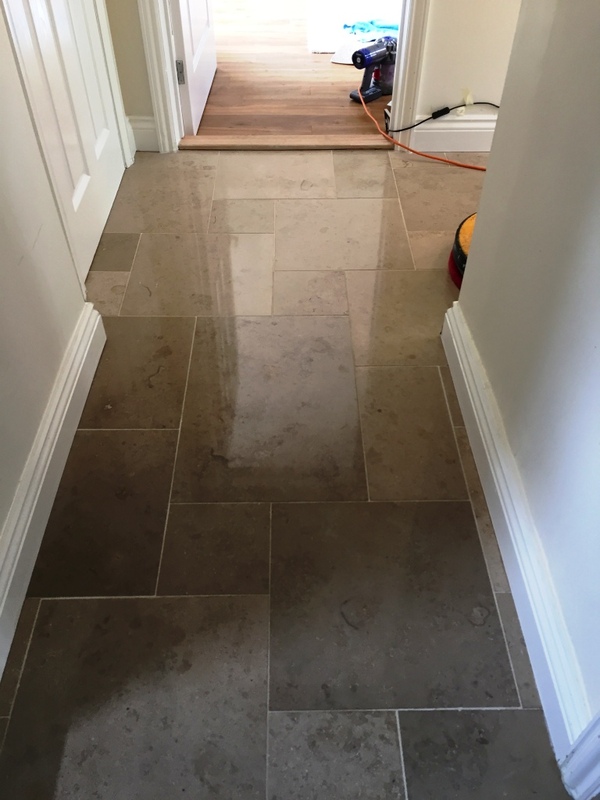 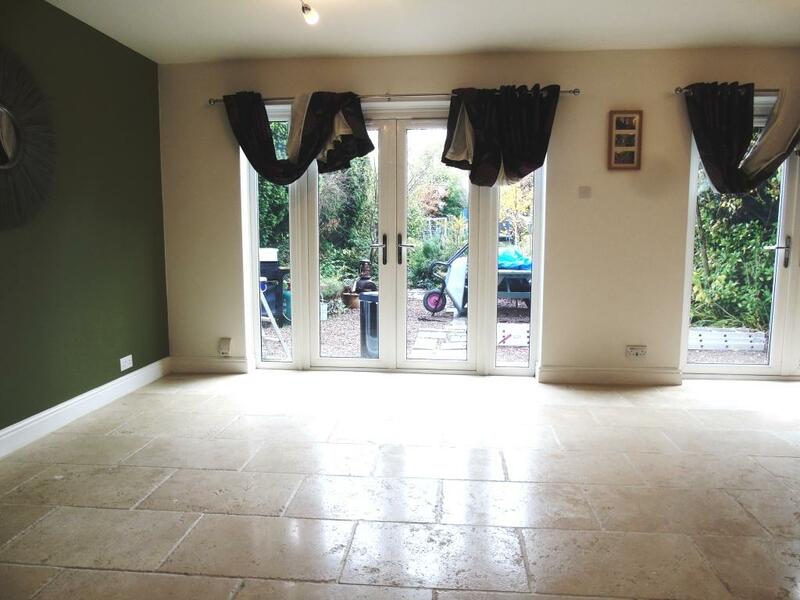 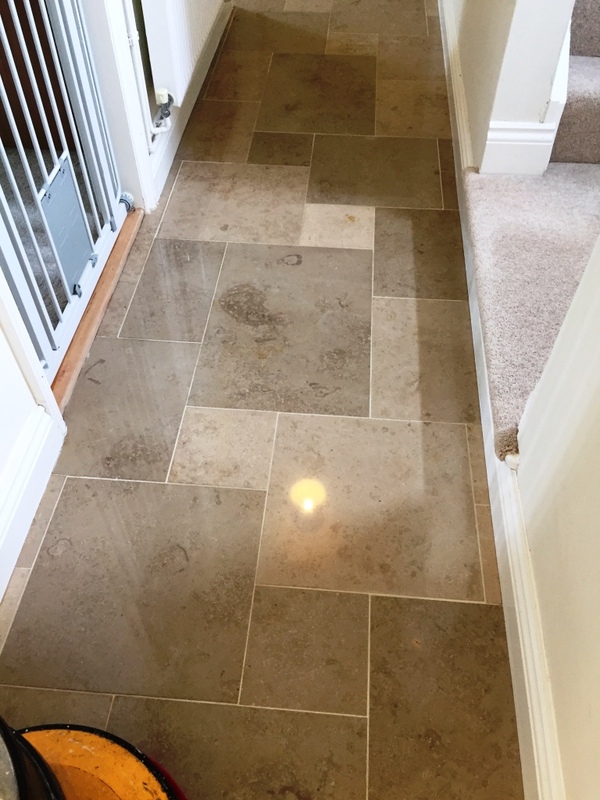 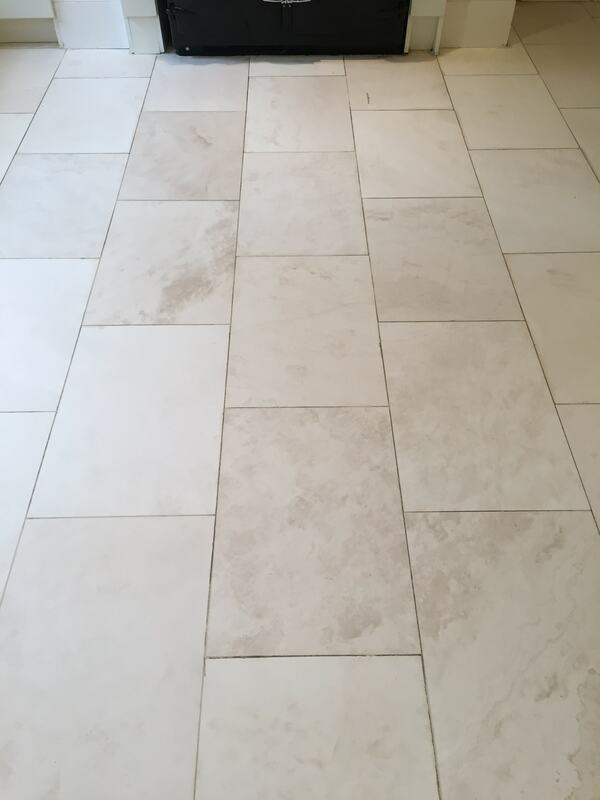 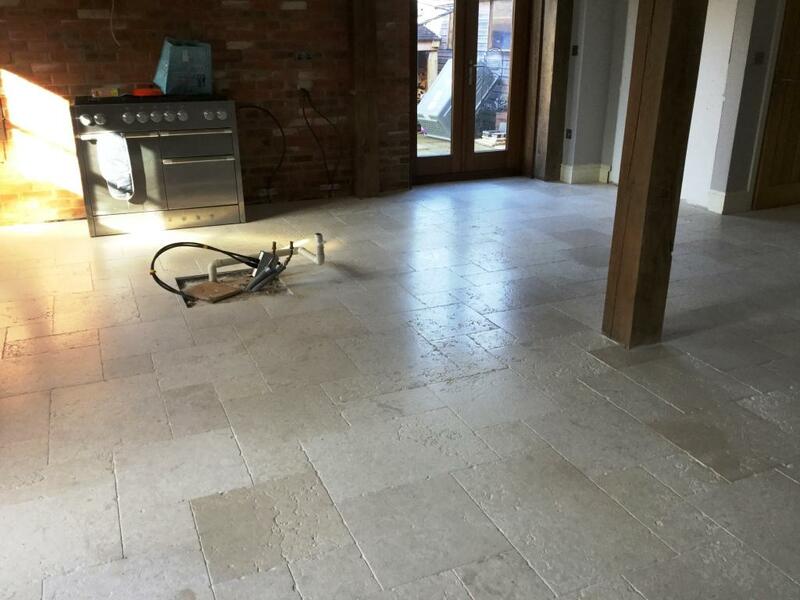 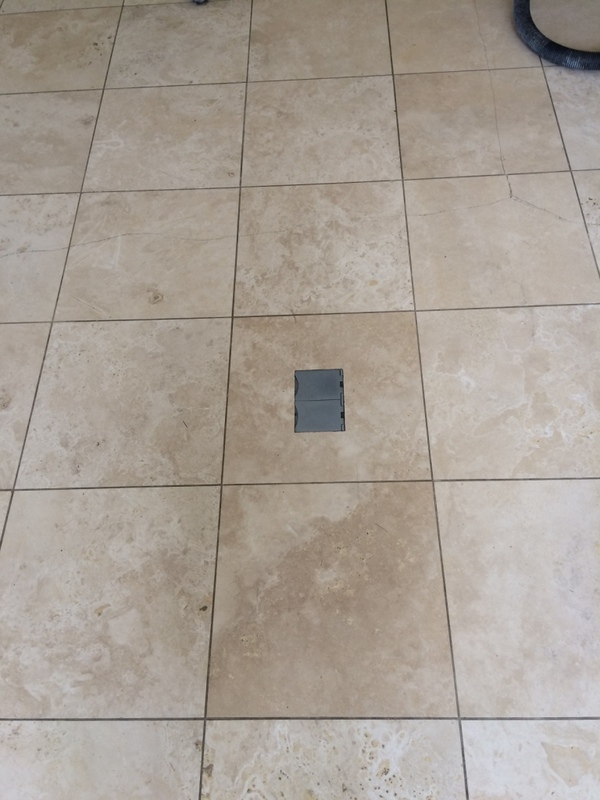 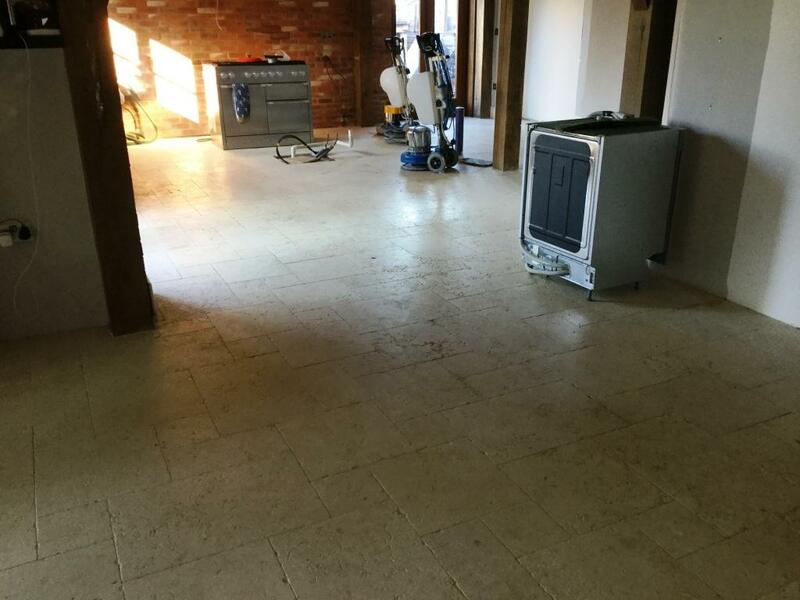 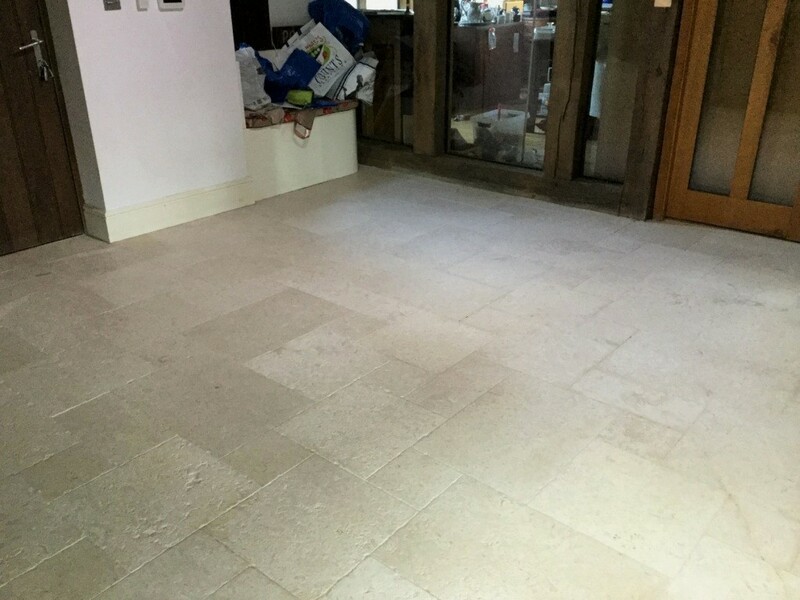 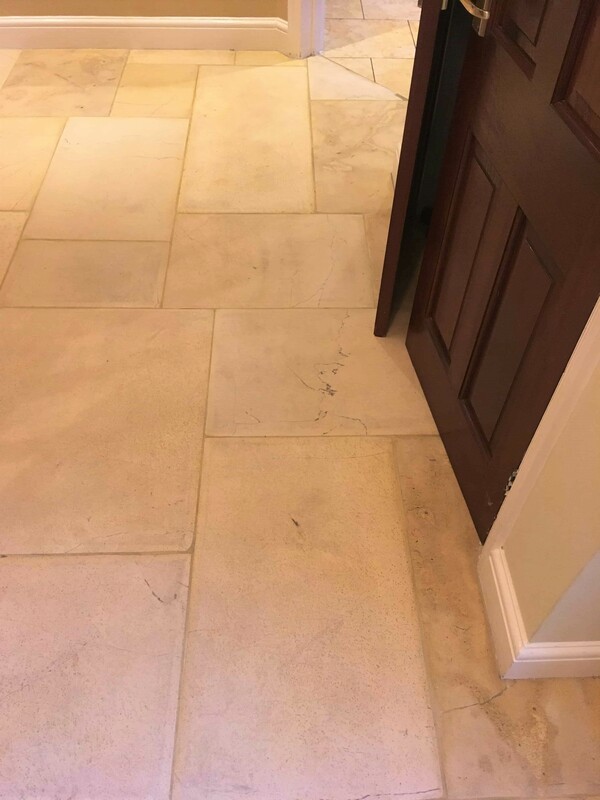 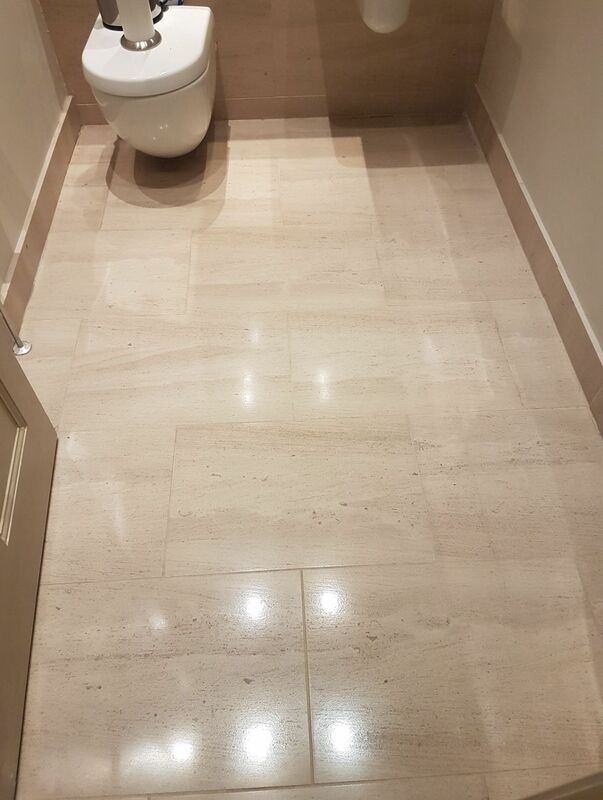 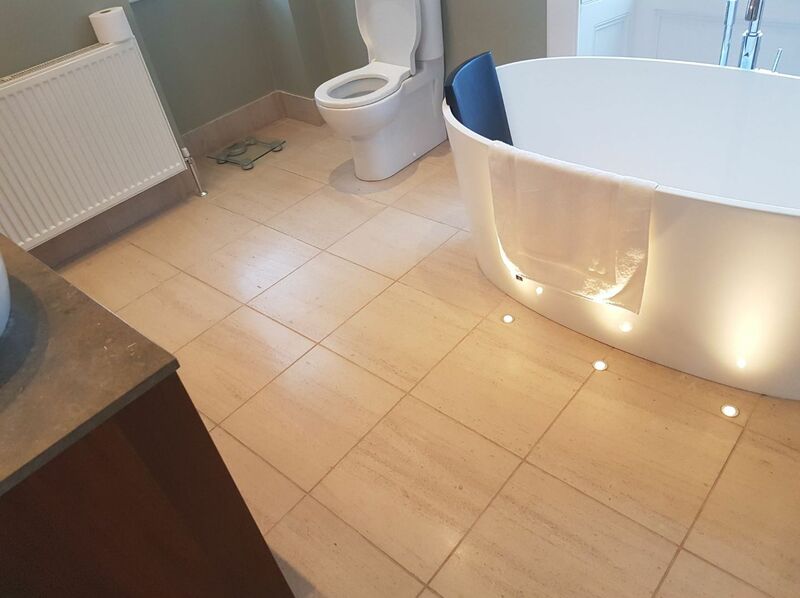 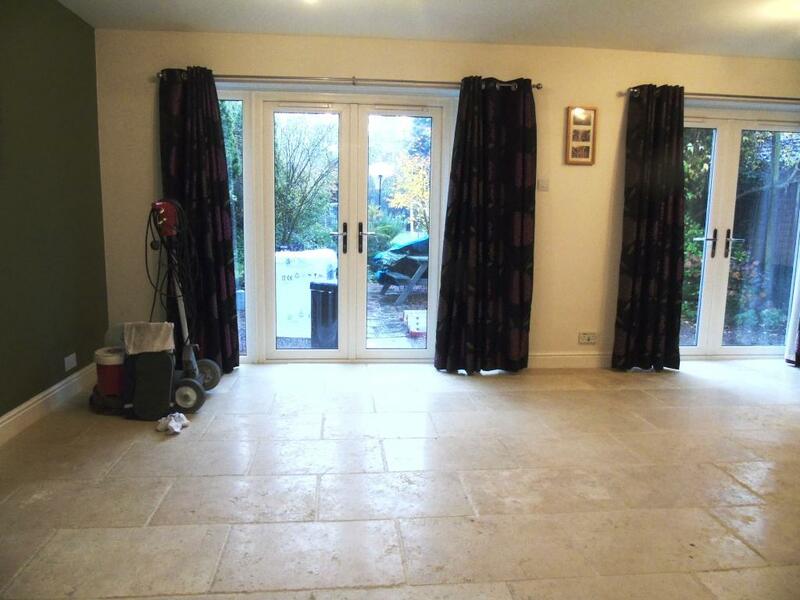 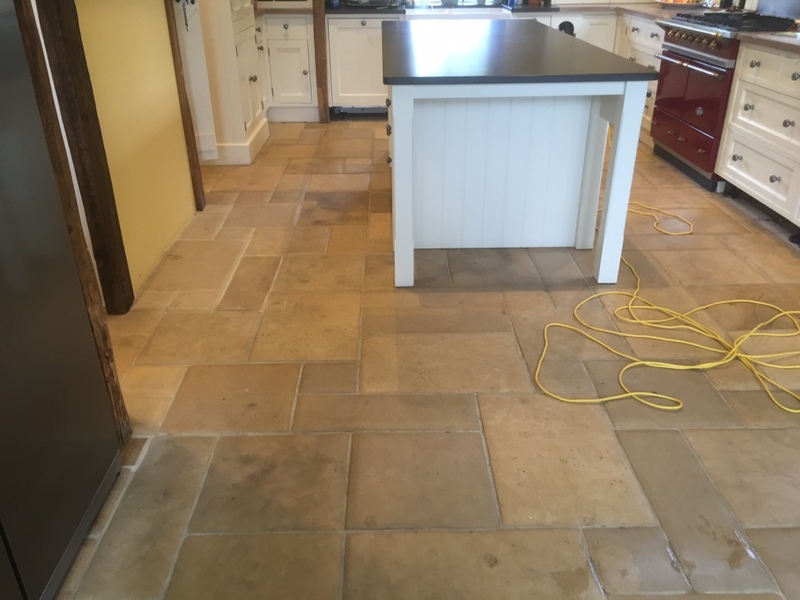 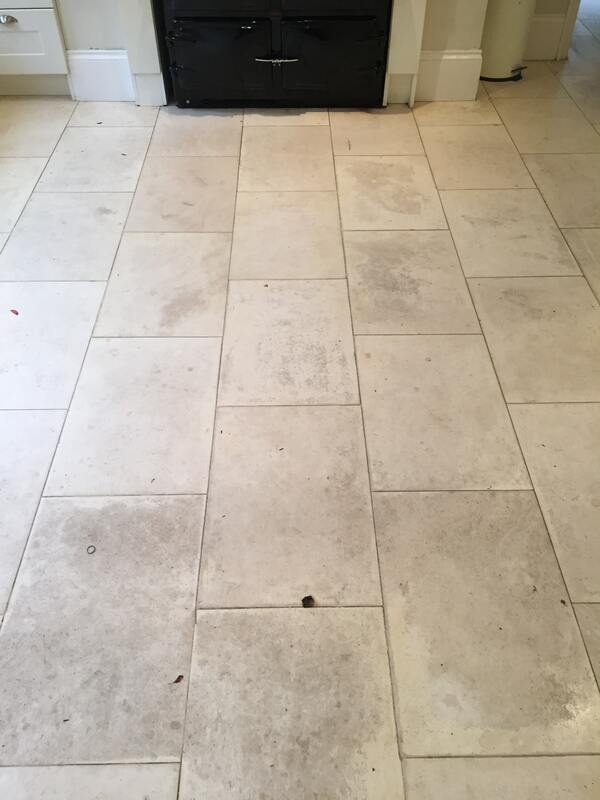 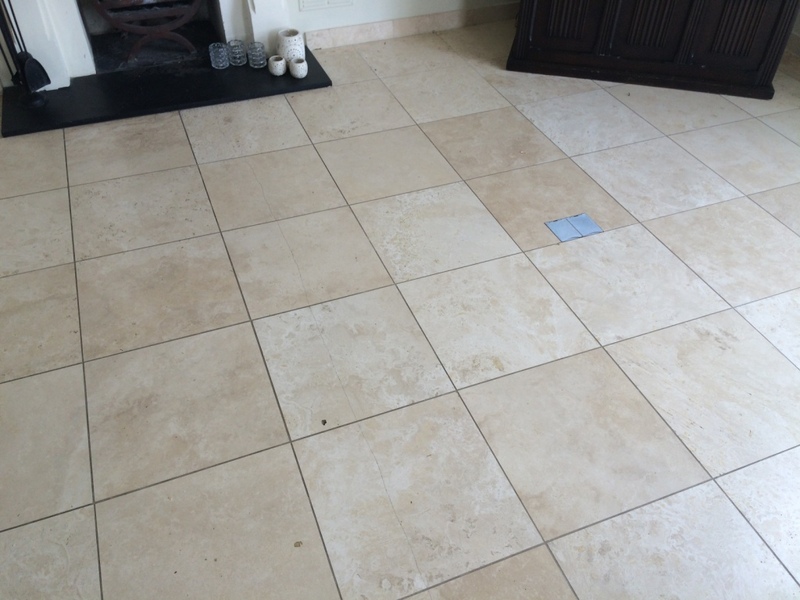 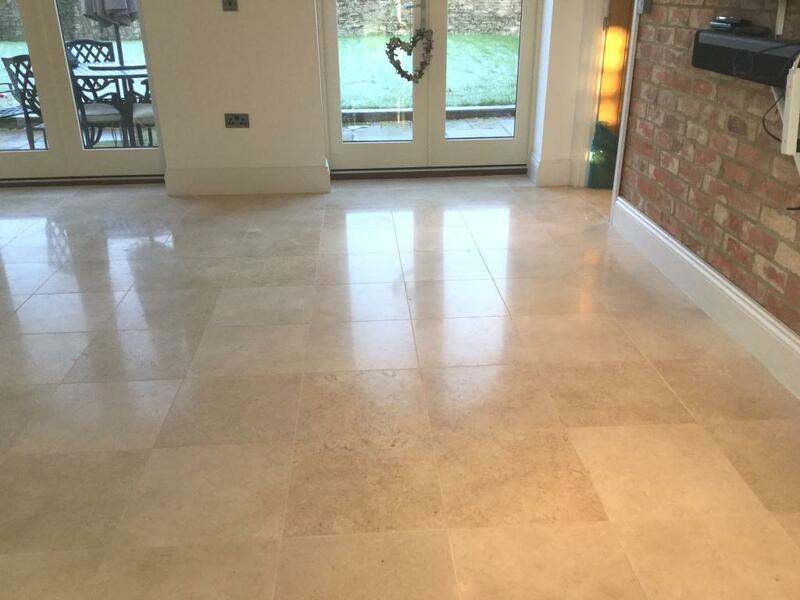 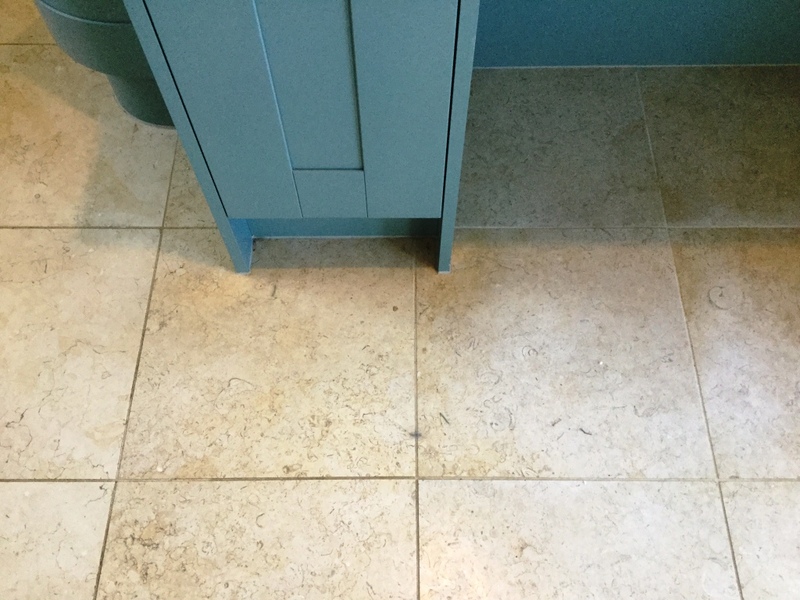 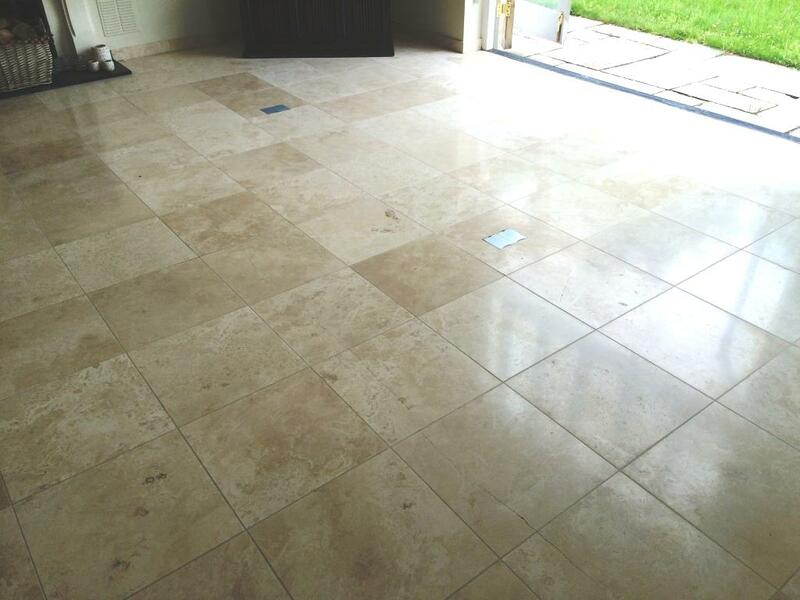 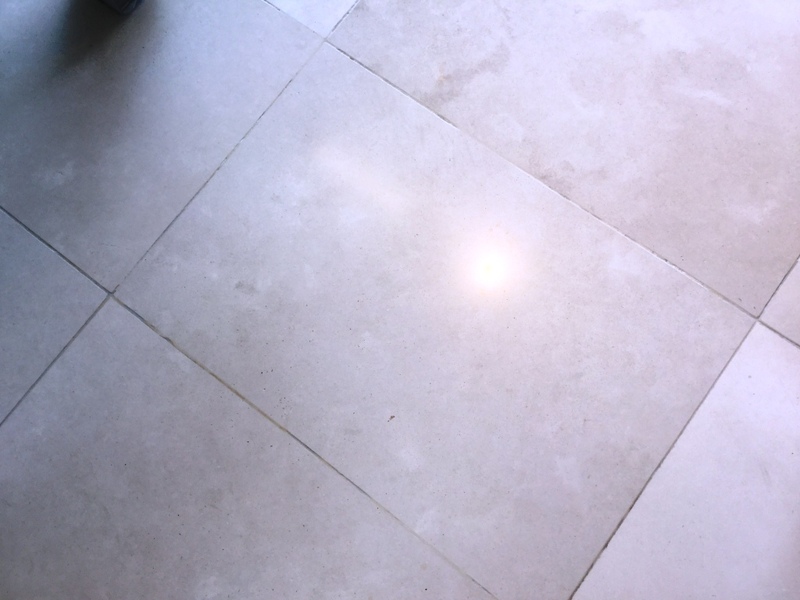 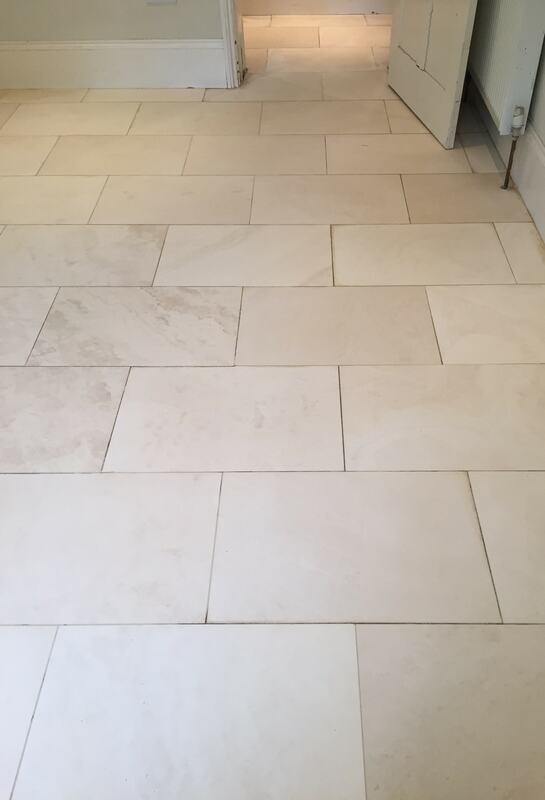 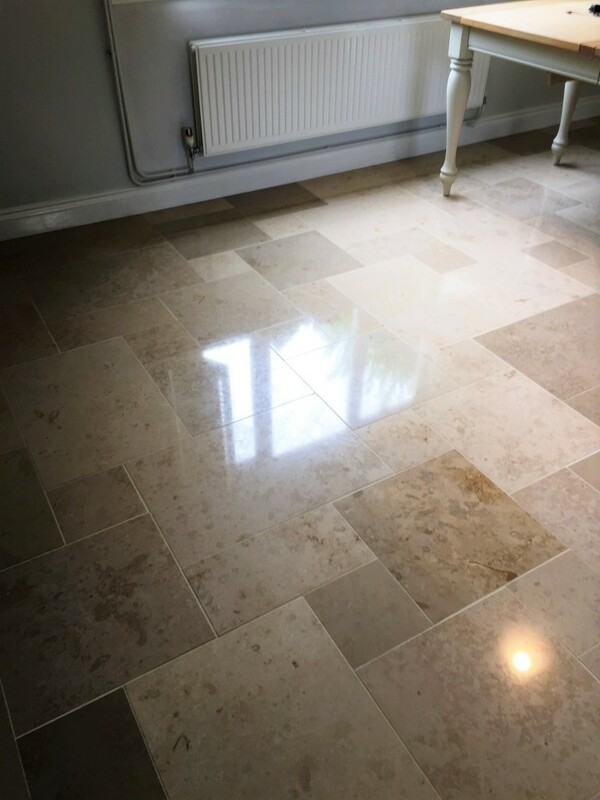 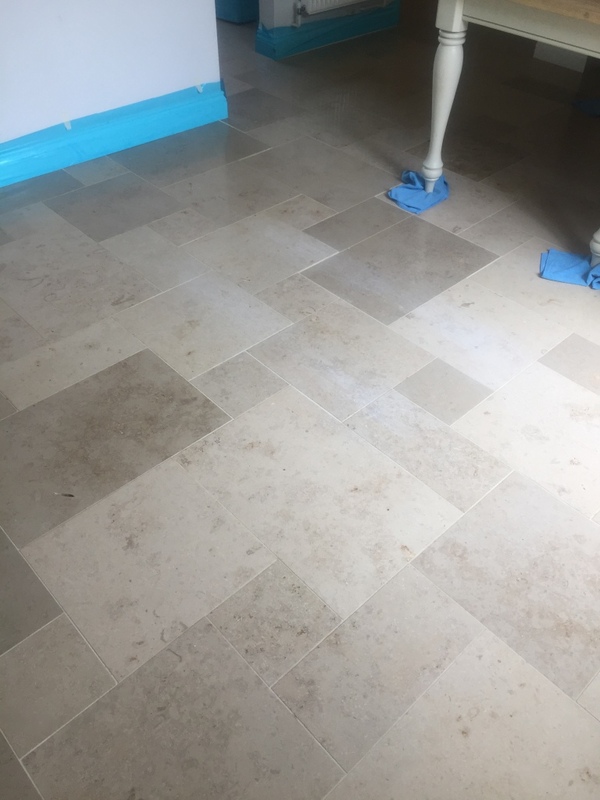 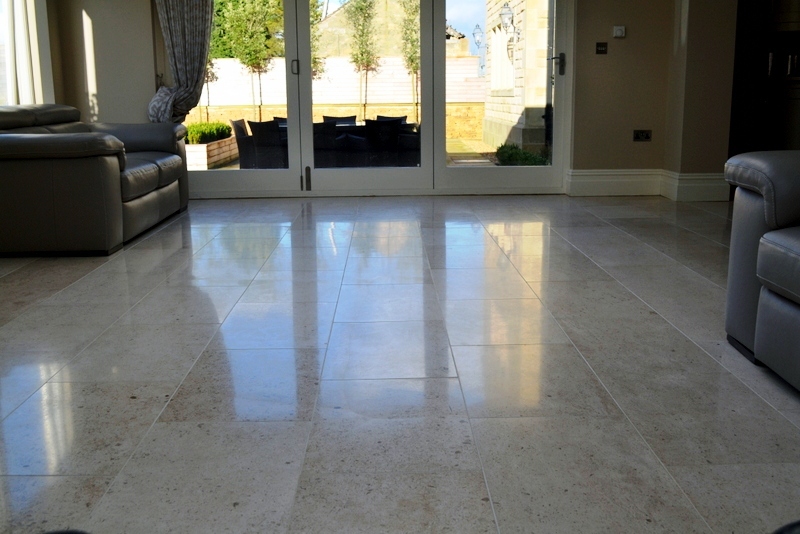 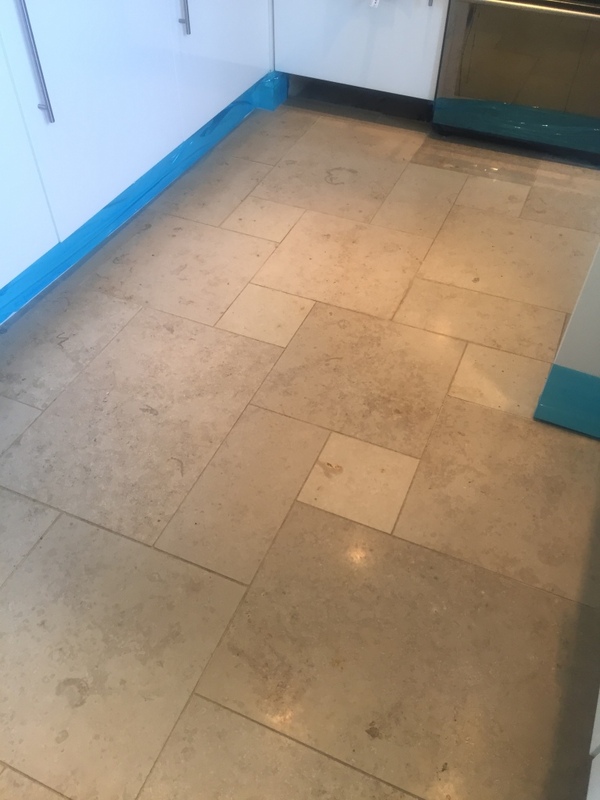 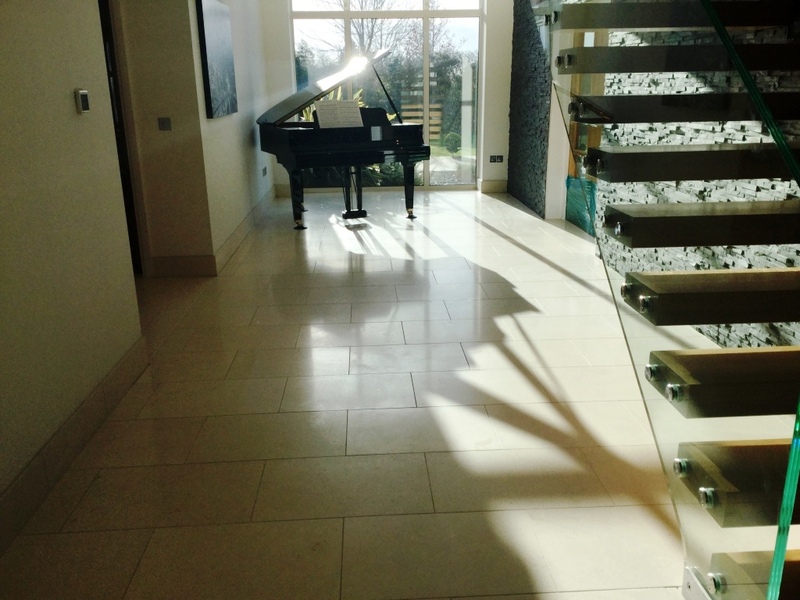 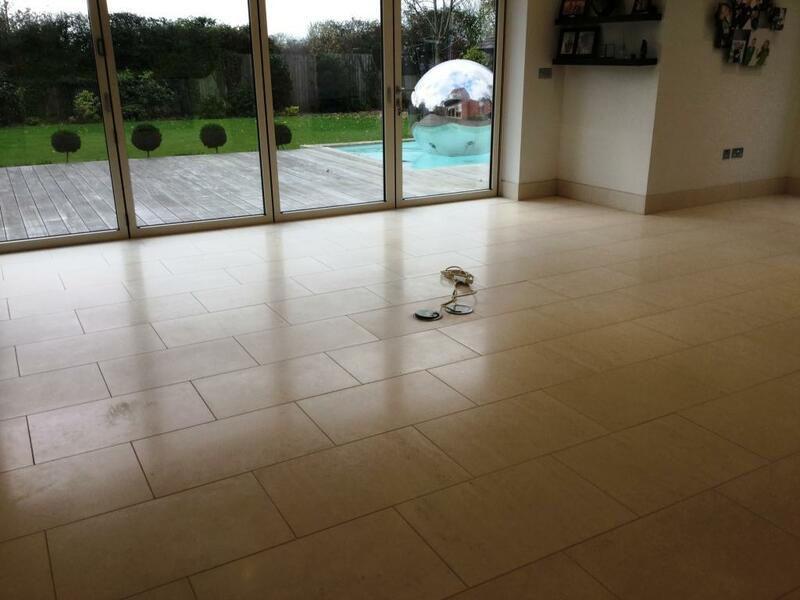 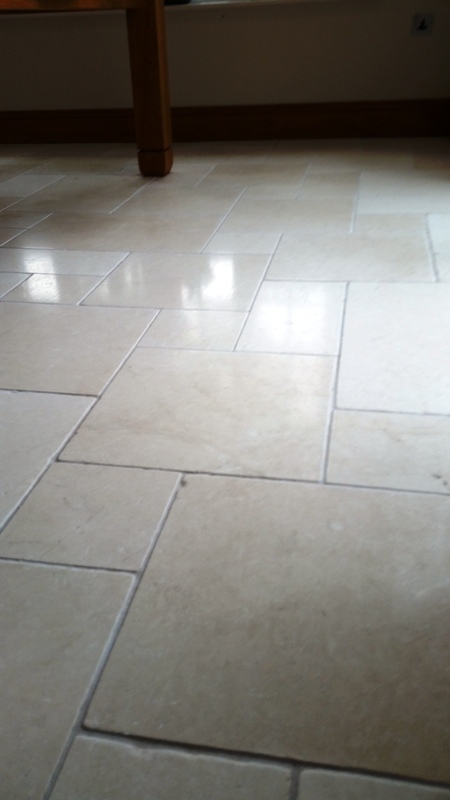 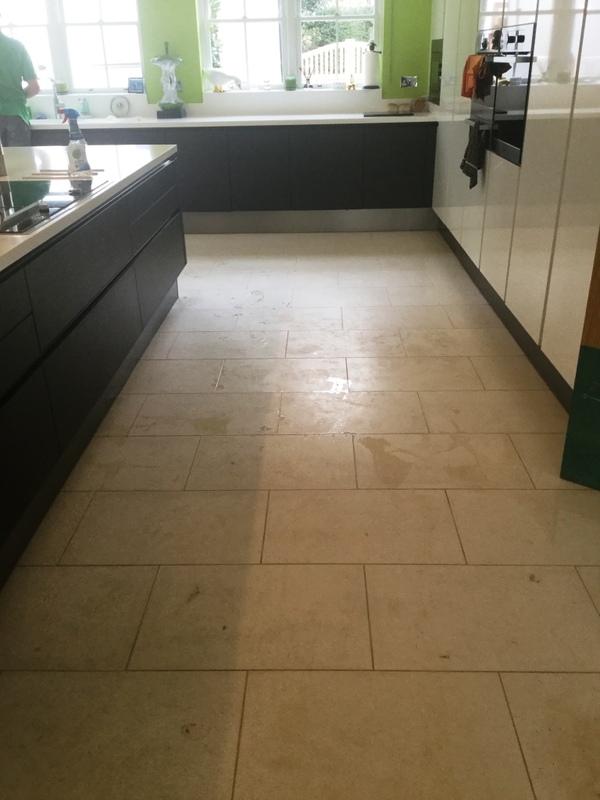 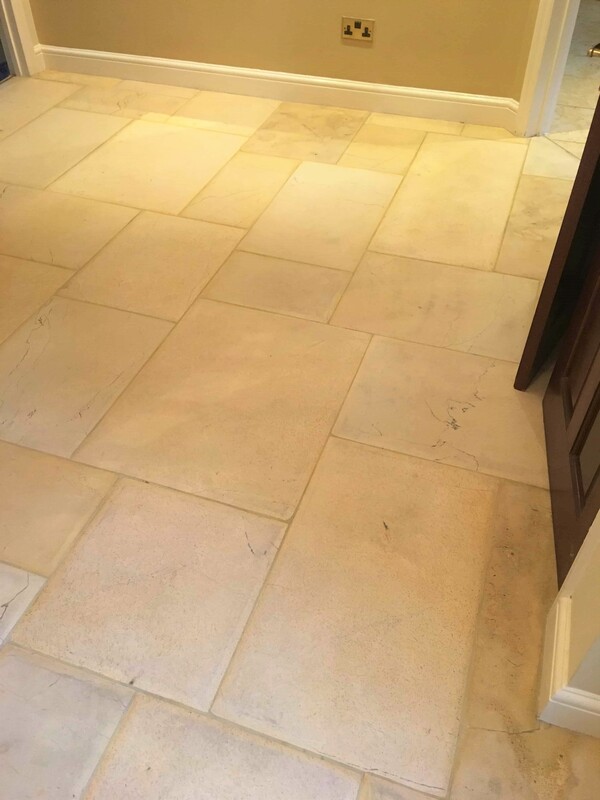 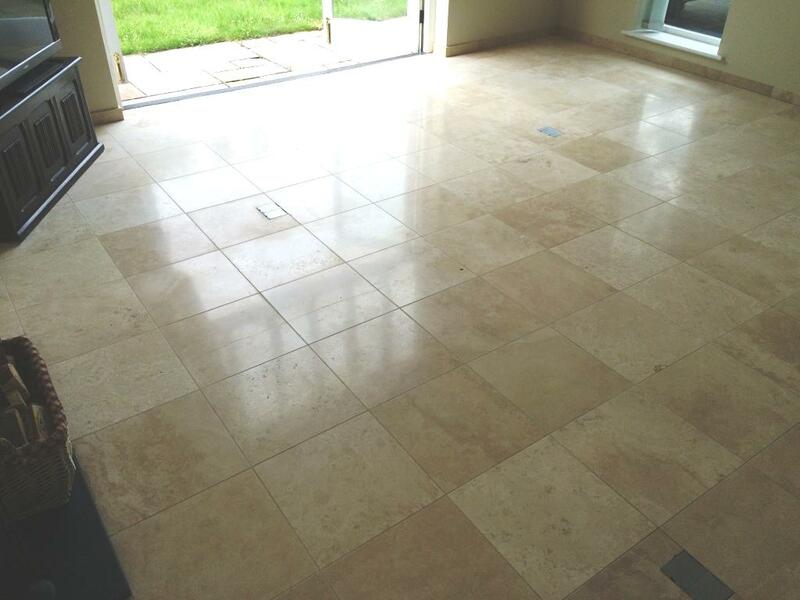 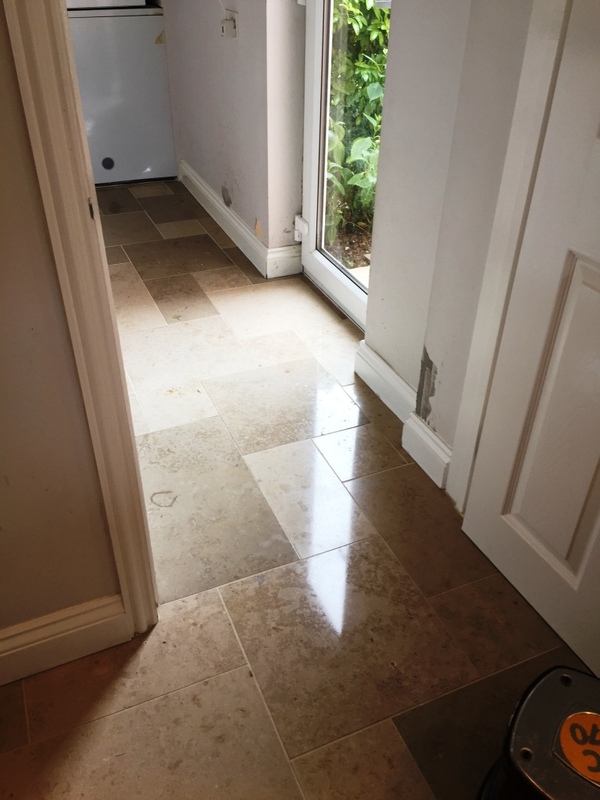 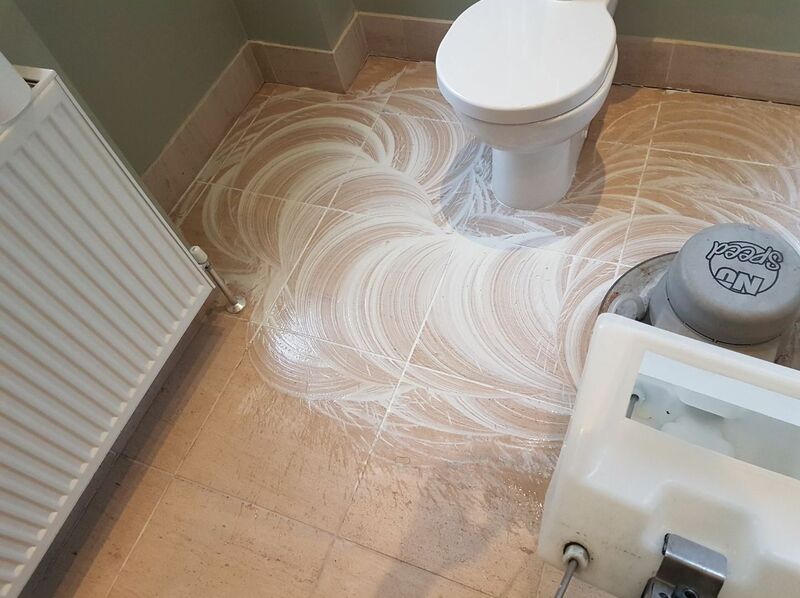 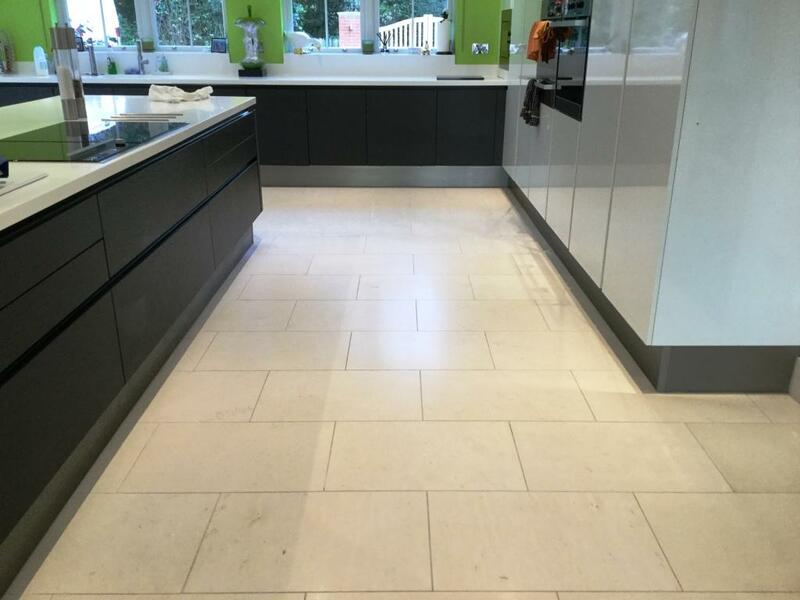 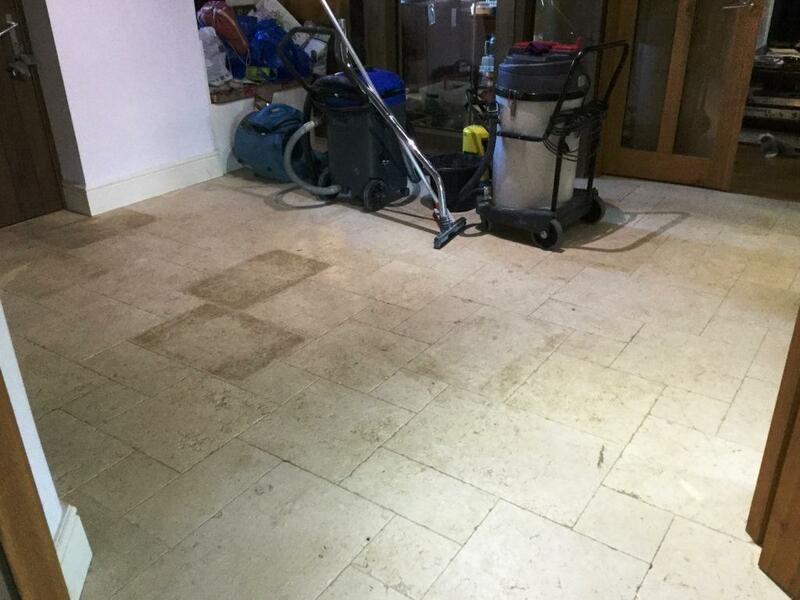 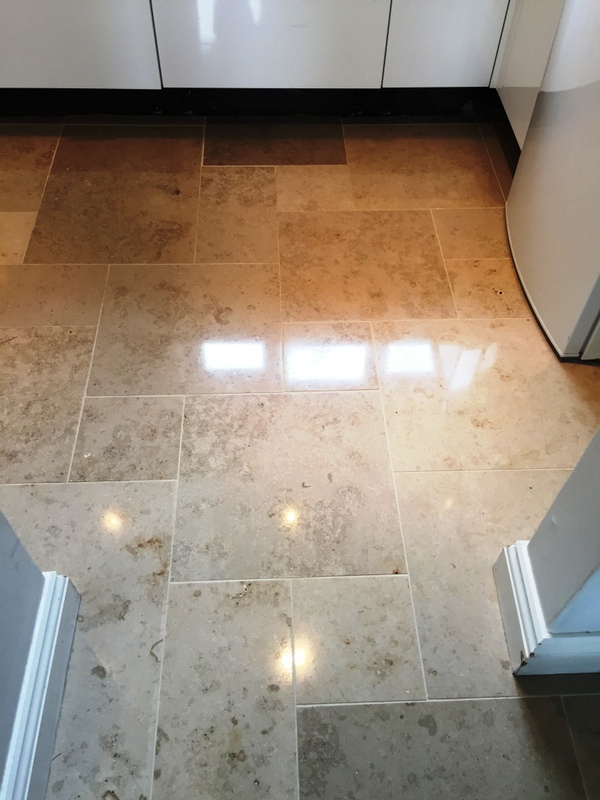 This was meant to be a relatively straightforward clean and polish of the Limestone tiles surrounding a swimming pool at a large house on the outskirts of Canterbury. 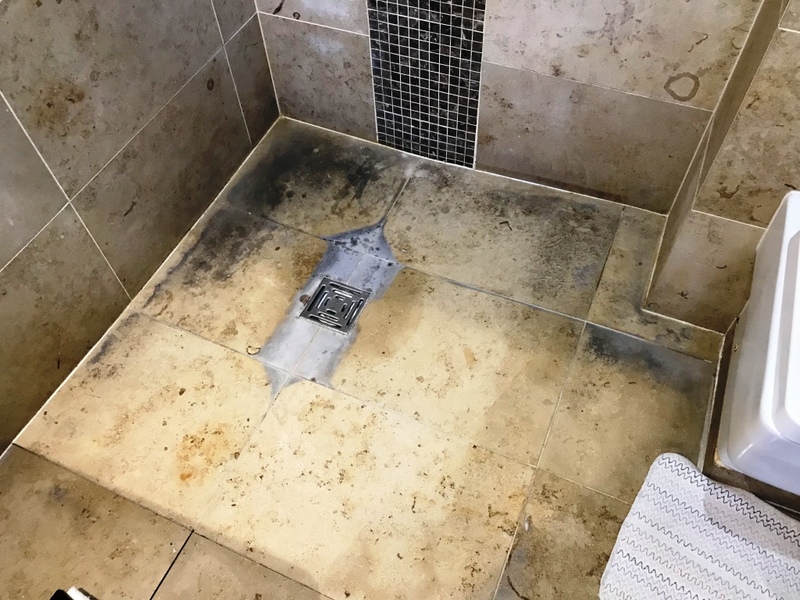 However, after visiting the property to survey the installation I discovered that a lot of the tiling around the edge of the pool was loose and water was getting in underneath. 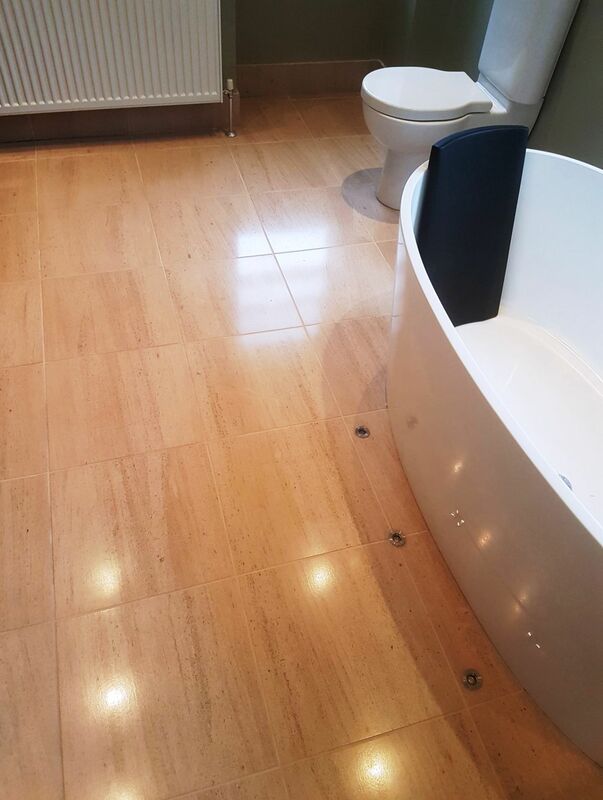 I discussed the problem with the owner and concerned about health safety he asked me to remove the affected tiles and refit them securely. 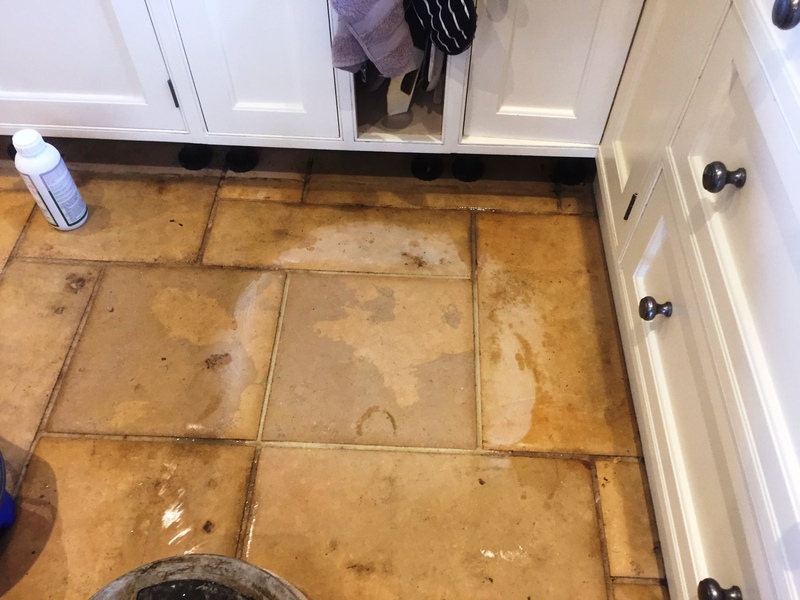 The Limestone tiles were also stained due to the chemicals in the pool however I already had a plan to burnish the stone tiles to resolve that problem. 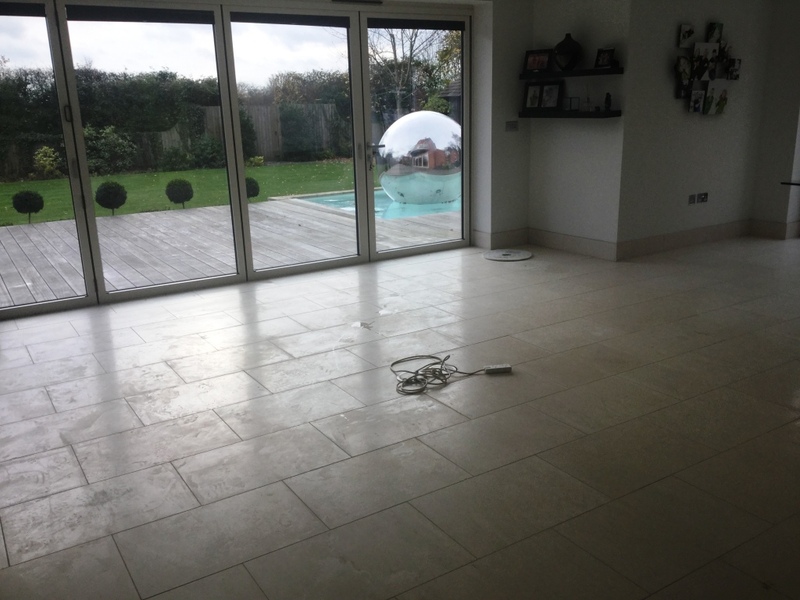 We agreed a date for the work and the owner agreed to have the pool drained in order to make the tiling work much easier. 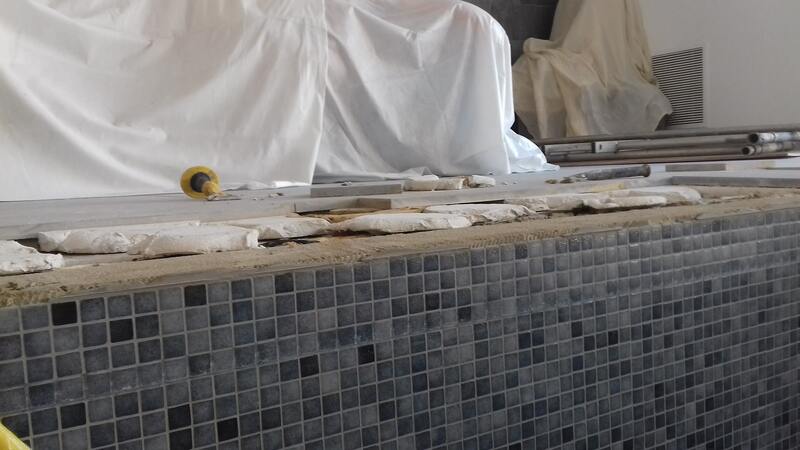 I returned to the property on the agreed date and started by setting up some scaffolding and adding plastic sheeting to the pool to protect the tiling. 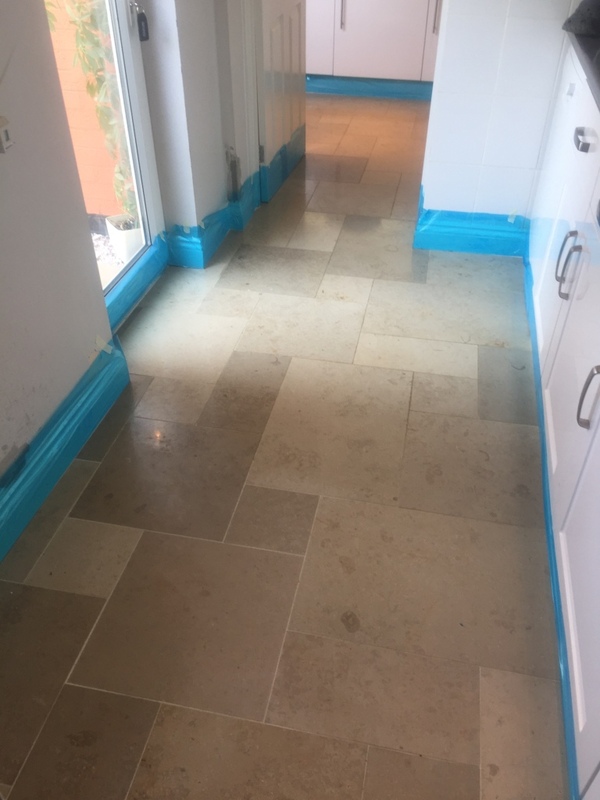 The next step was to tackle the loose Limestone which is when I discovered that the tiles had only been secured in a few places with what could best be described as blogs of tile adhesive which left a large cavity for water to sit. 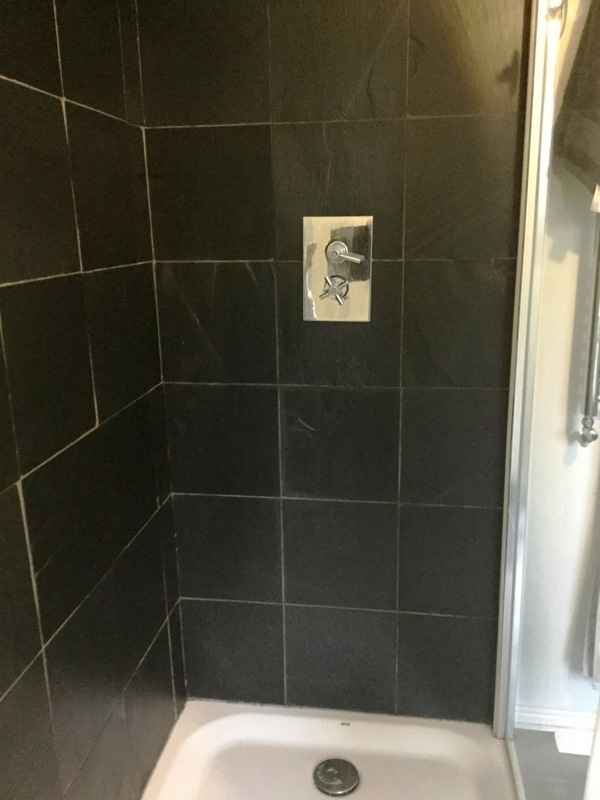 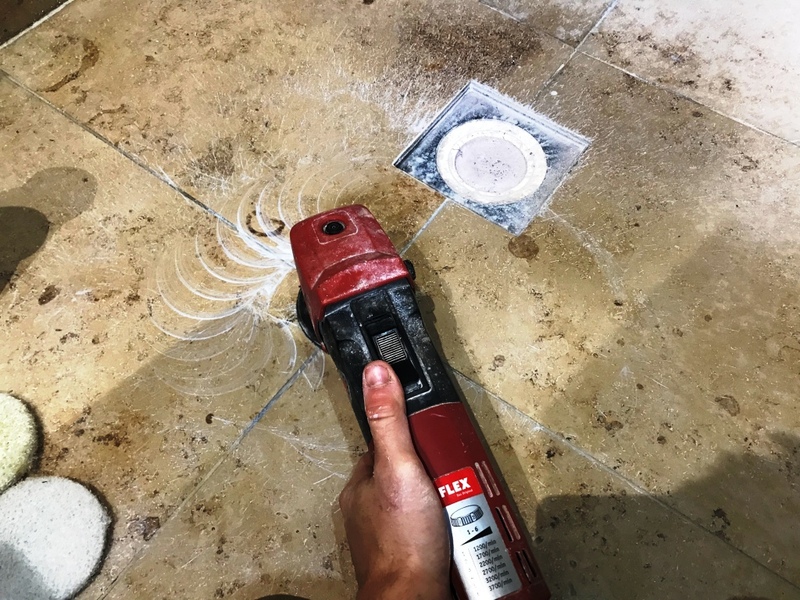 This practice is often referred to in the tiling trade as “Dot and Dab” and very much frowned upon. 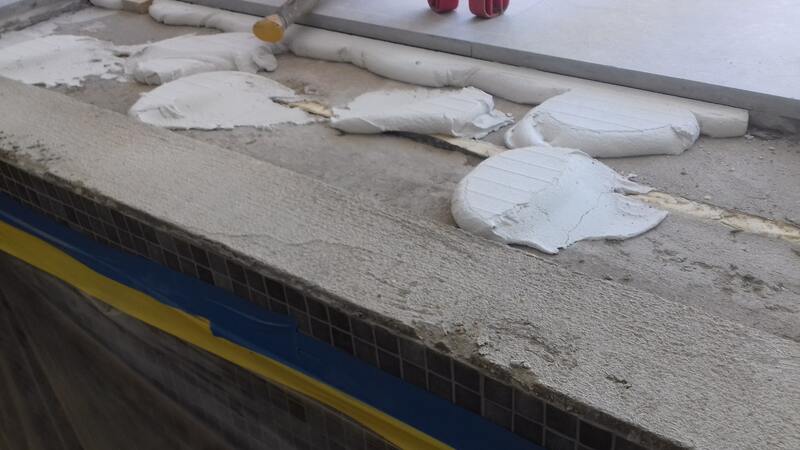 The tiles should have been fully bonded onto a layer of adhesive that had been spread with a notched trowel to form a very secure bond and ensure water could not seep underneath. 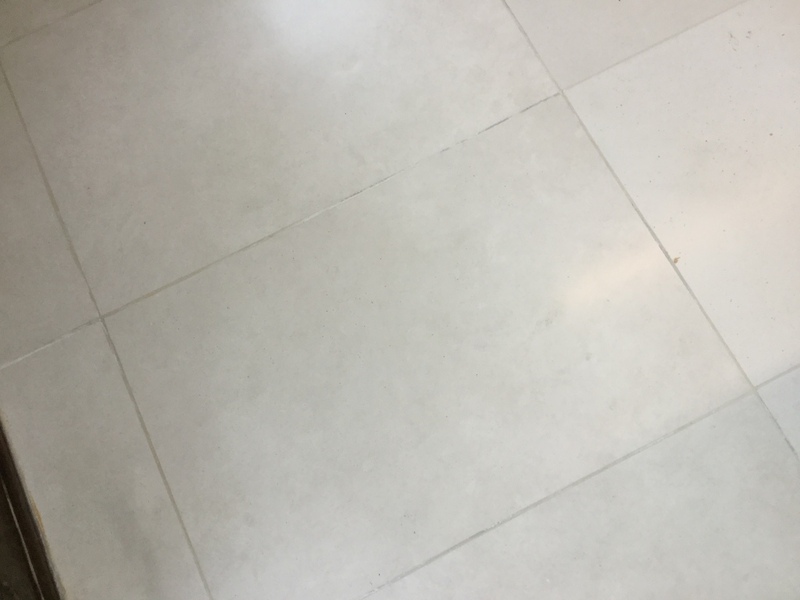 TIP: If you want to check your tiling to see if it has been “Dot and Dabbed” then tap the tiles with the end of a wooden broom handle, it should sound dull throughout, if the tapping sounds hollow in certain areas then this indicates Dot and Dabbing. 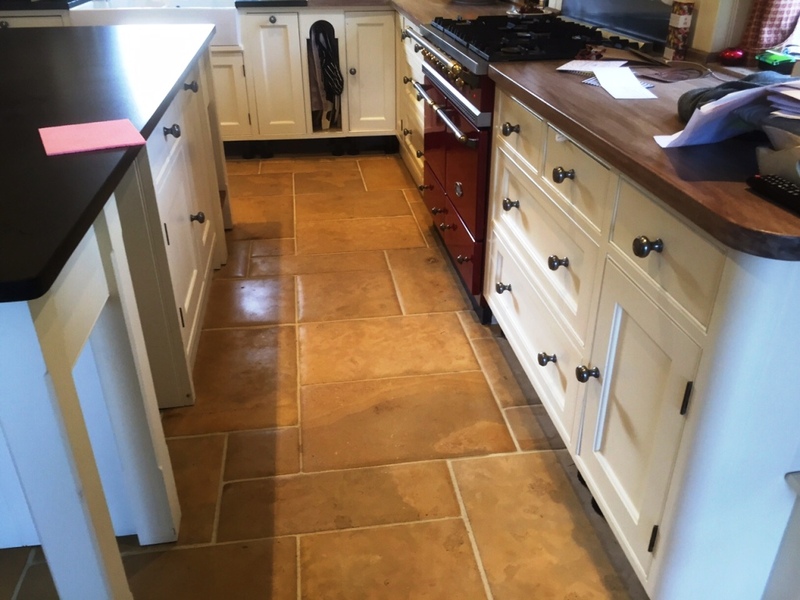 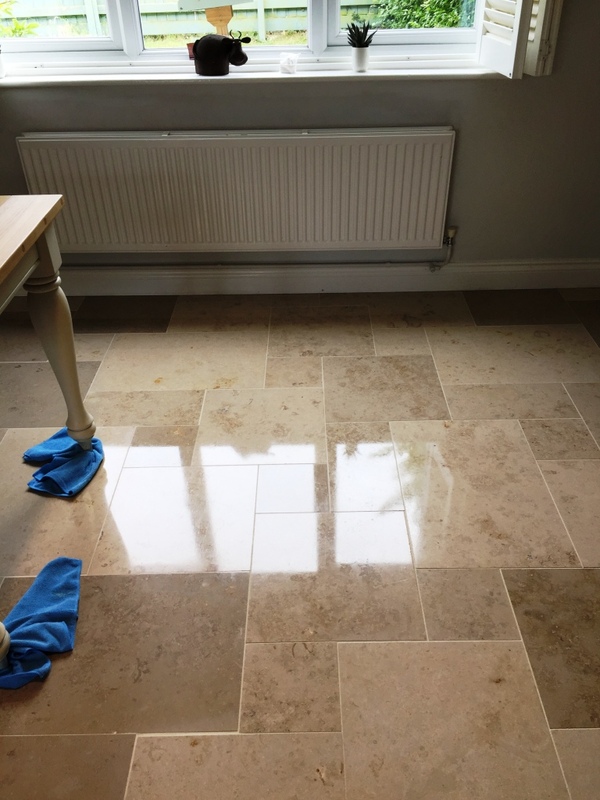 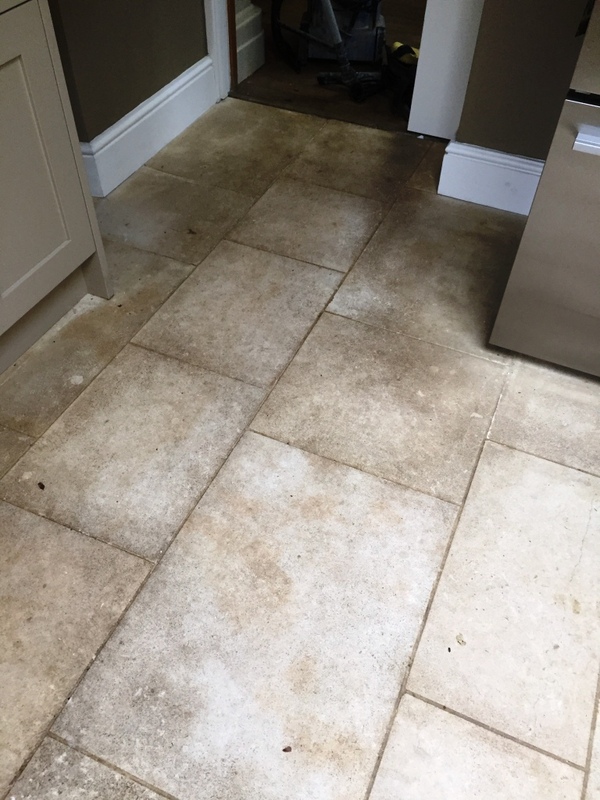 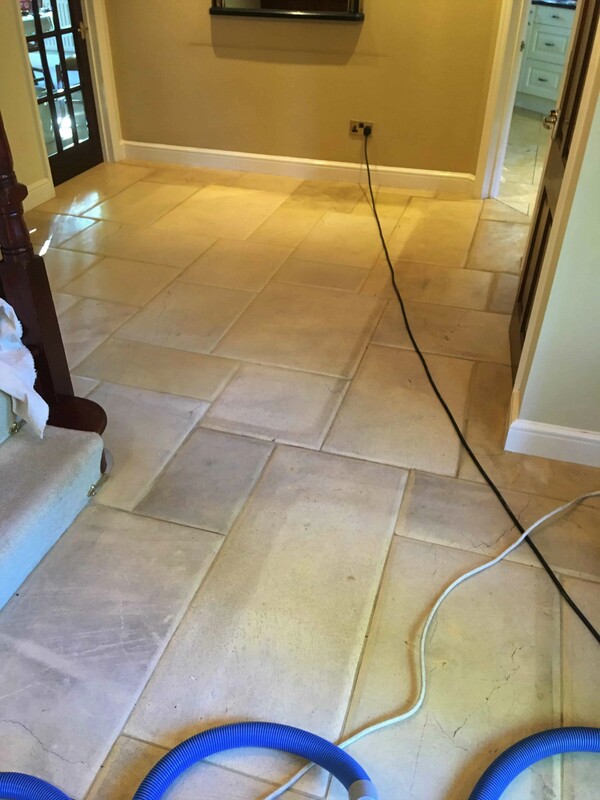 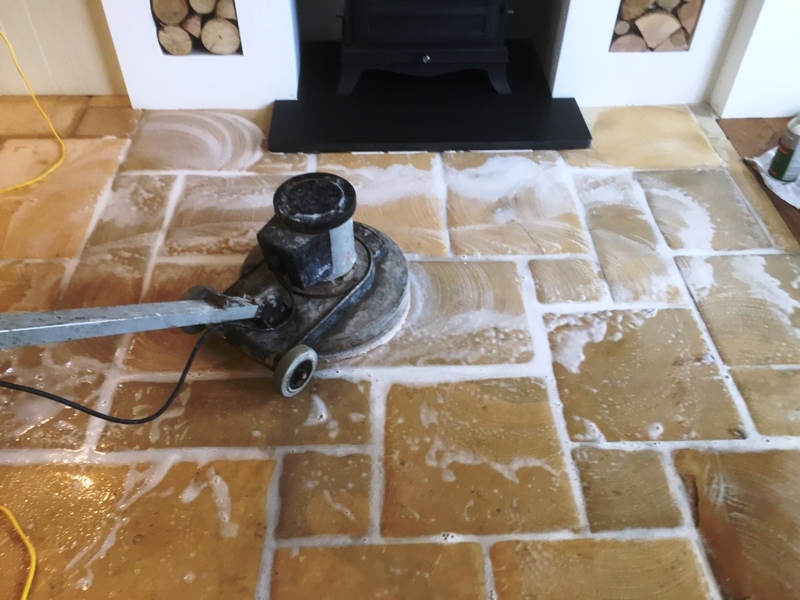 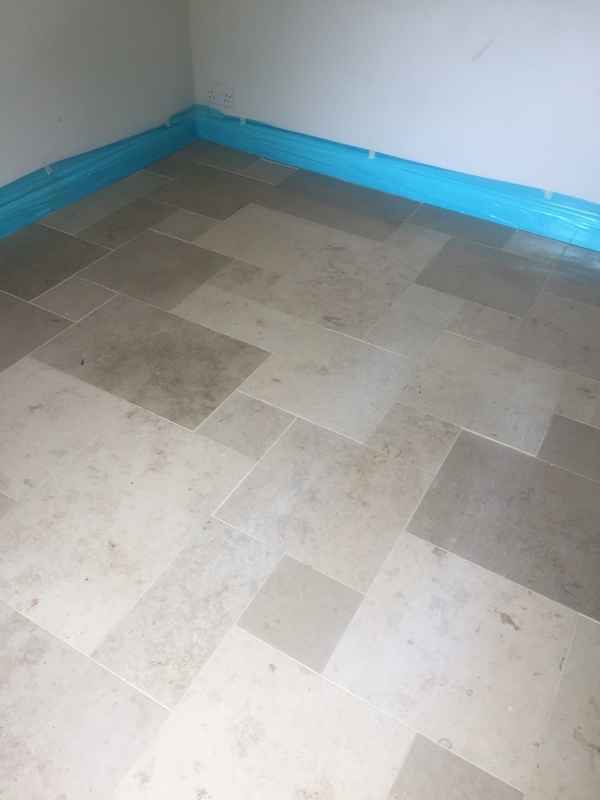 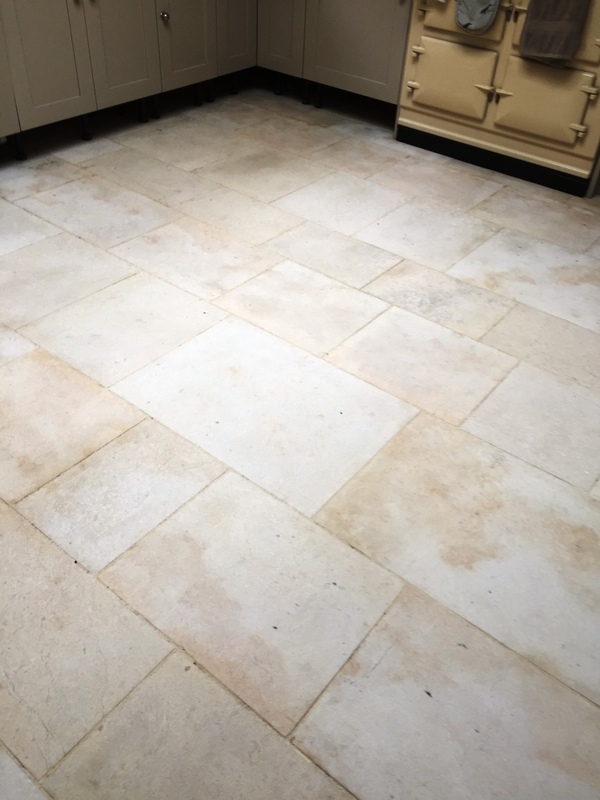 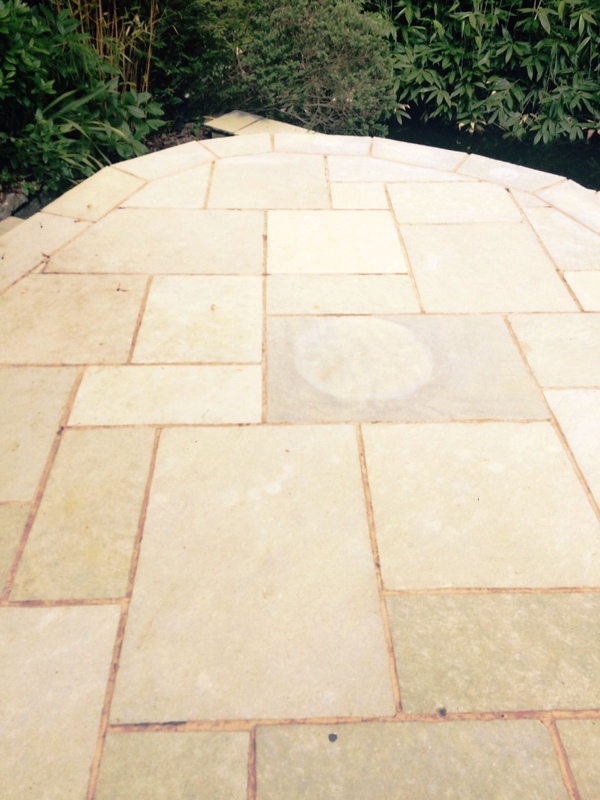 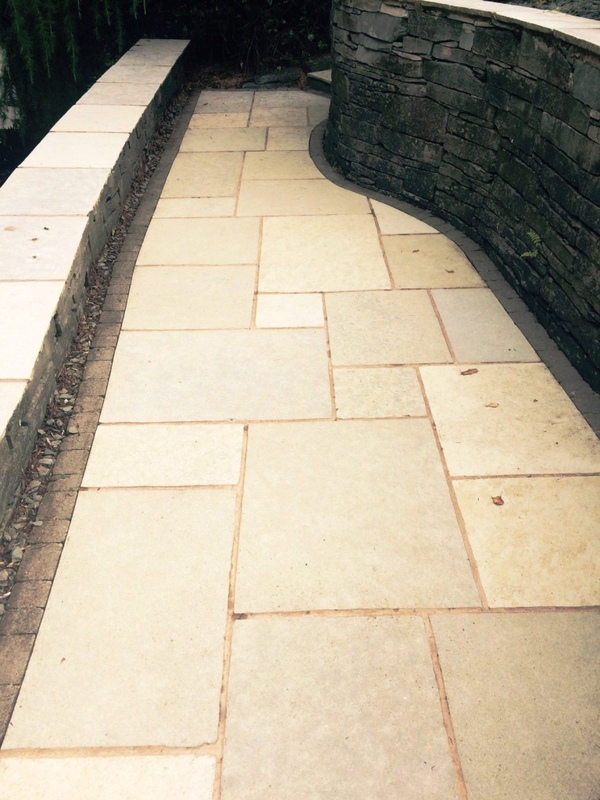 The remedy was to lift all the affected limestone edging including the dabbed adhesive and then allow the affected area to dry out thoroughly. 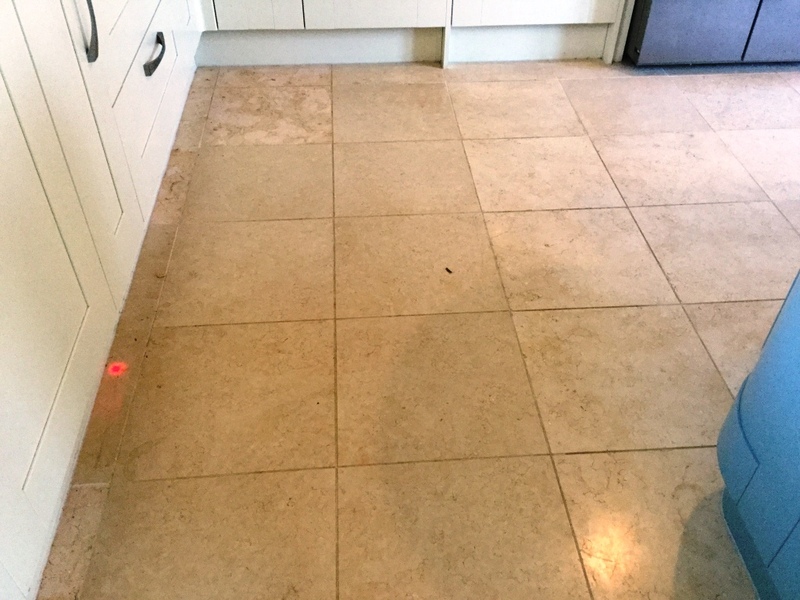 I then returned two weeks later to level off the surface with a water proof screed before re-installing the tiles. 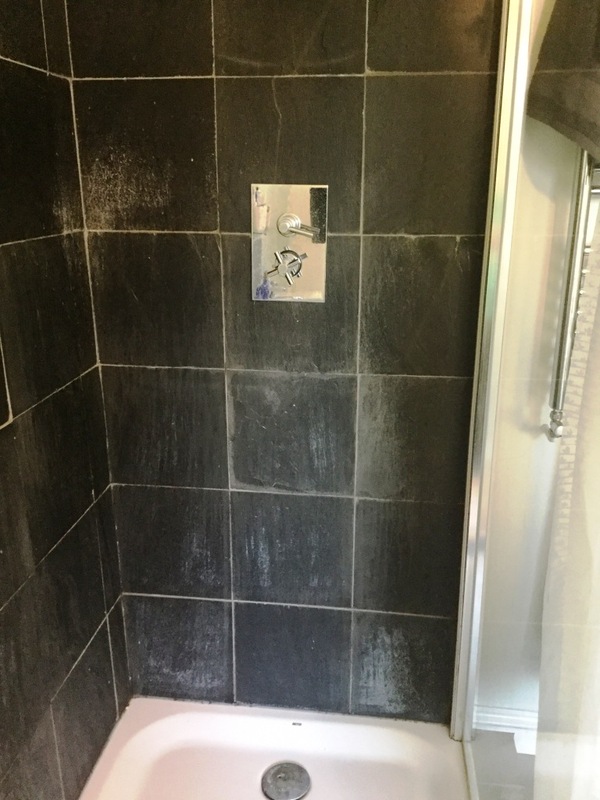 The tile adhesive and grout needed to be dry before the next stage of cleaning so once I had completed this step, I used the rest of the day to clean up and removing the plastic sheeting and scaffolding. 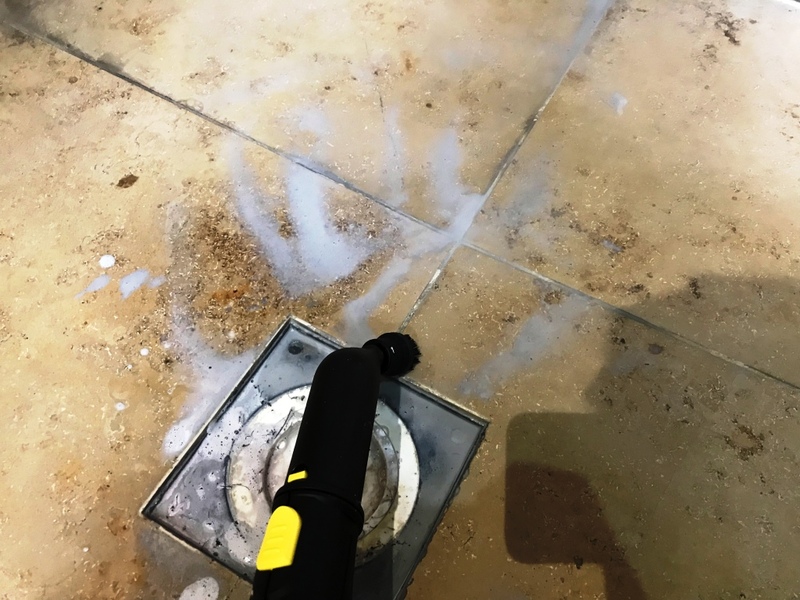 On the next day I checked my previous work was secure and then set about cleaning the floor with a set of Diamond burnishing pads. 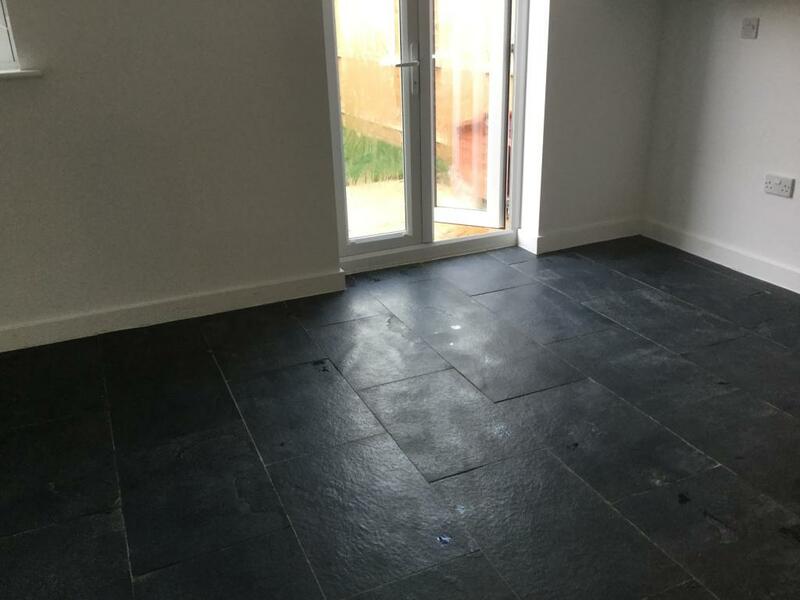 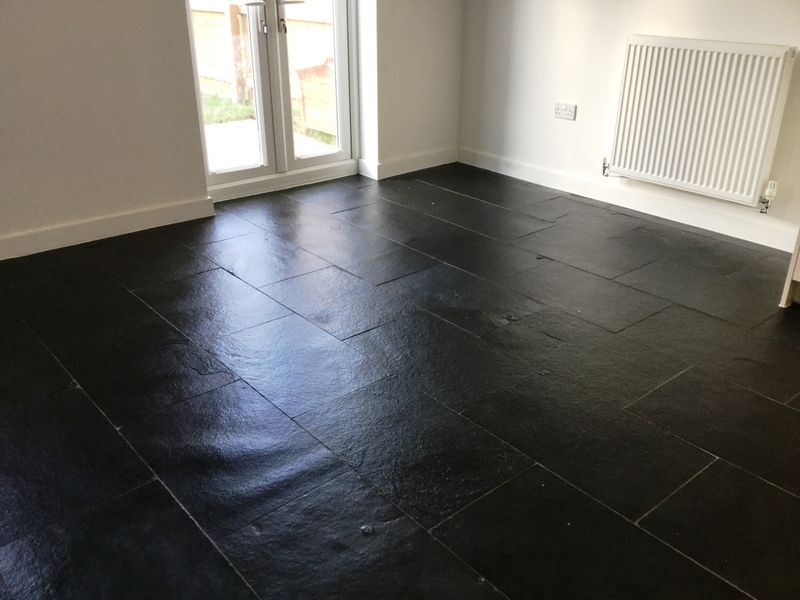 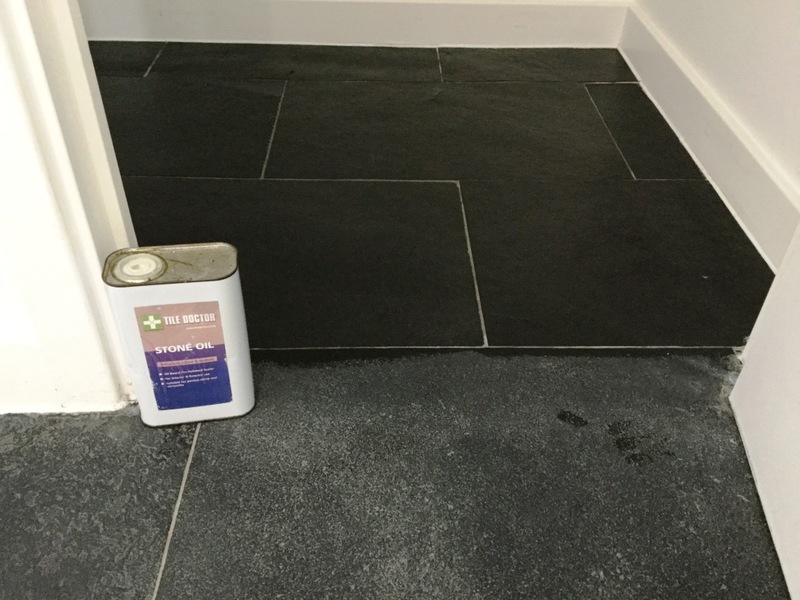 You start with the application of a coarse 400-grit pad, then move onto medium 800-grit pad, fine 1500-grit pad and finishing with the extra fine 3000-grit pad. 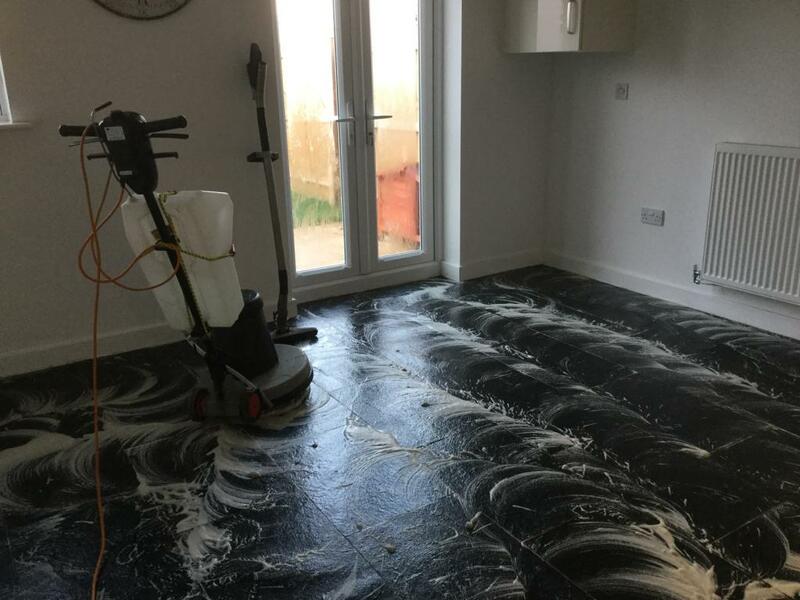 The pads are fitted to a rotary floor buffer and are run over each tile using water for lubrication. 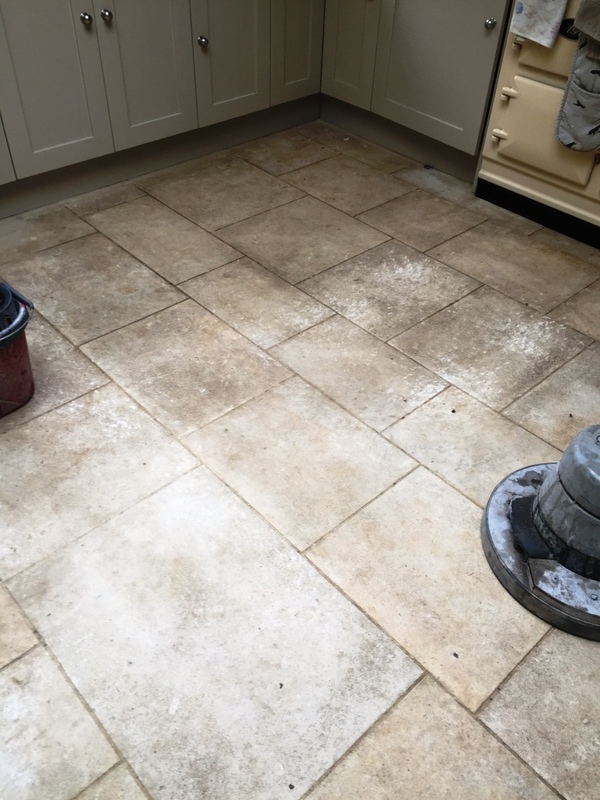 The floor is rinsed between the application of each pad so the fine slurry produced can be extracted using a wet vacuum. 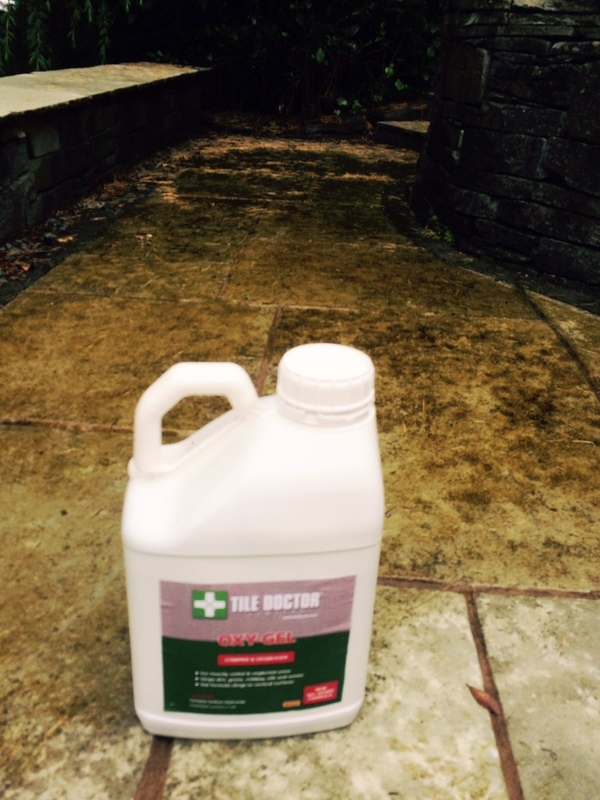 Fortunately, due to the pool being emptied I didn’t have to worry too much about contaminating the pool water. 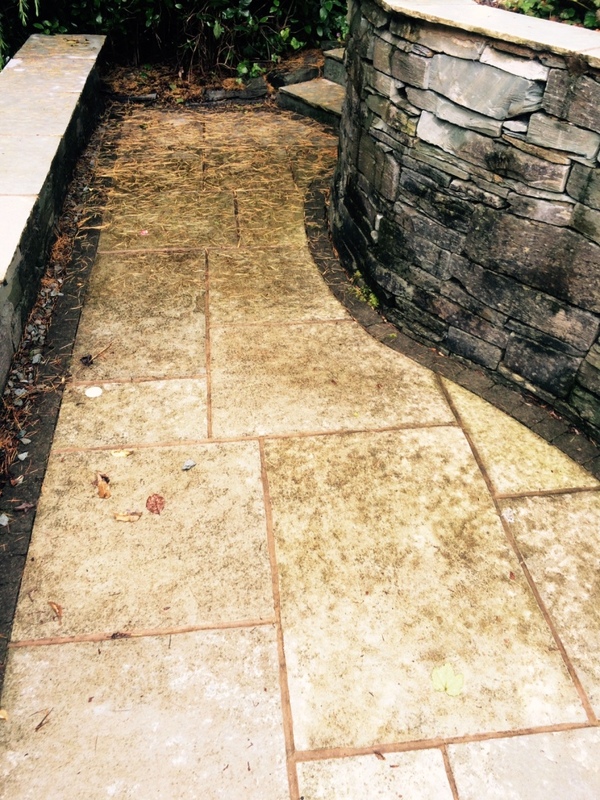 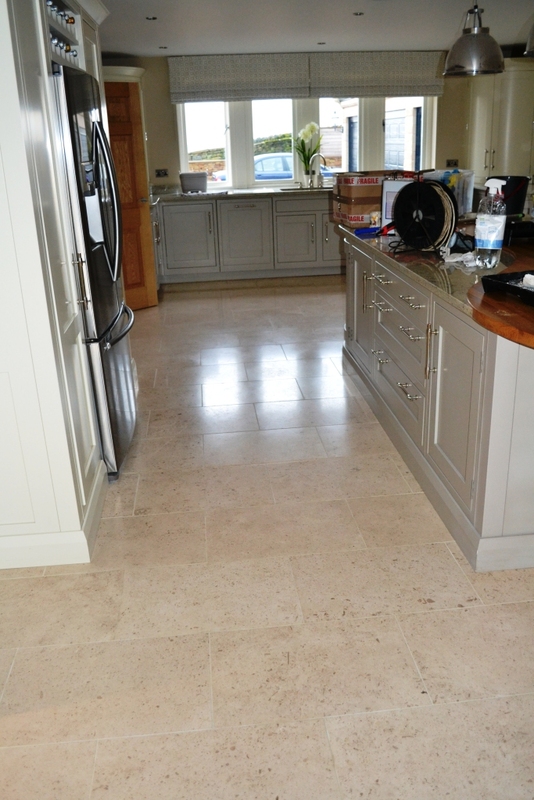 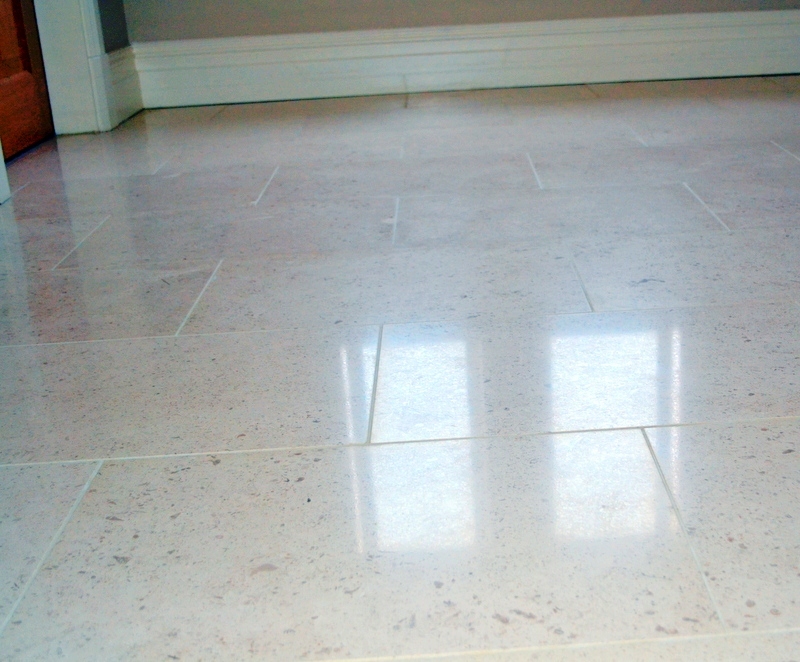 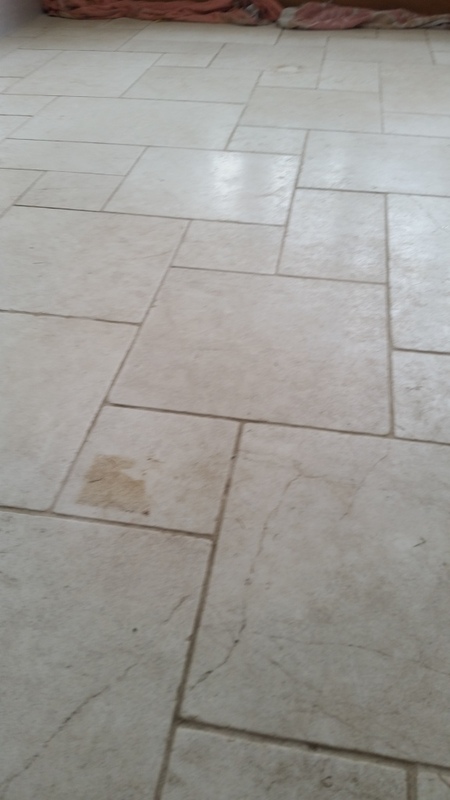 The pads made a big difference to the stained Limestone and really brought out the best in the them. 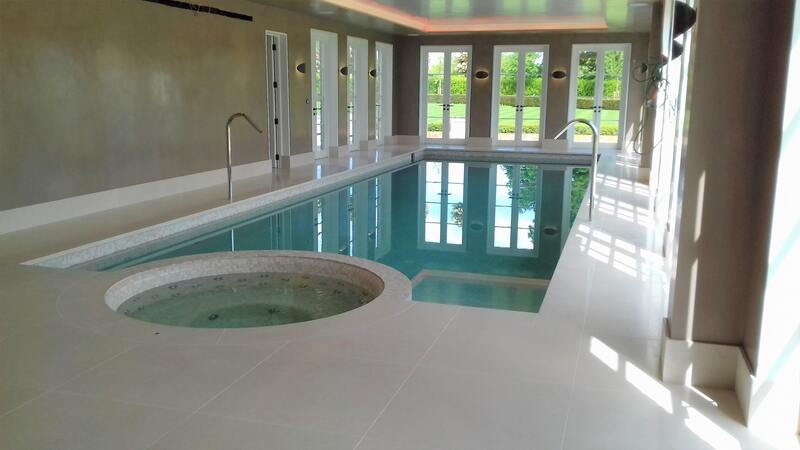 Once the pool had been refilled the whole scene looked amazing, I just wished I taken more pictures. 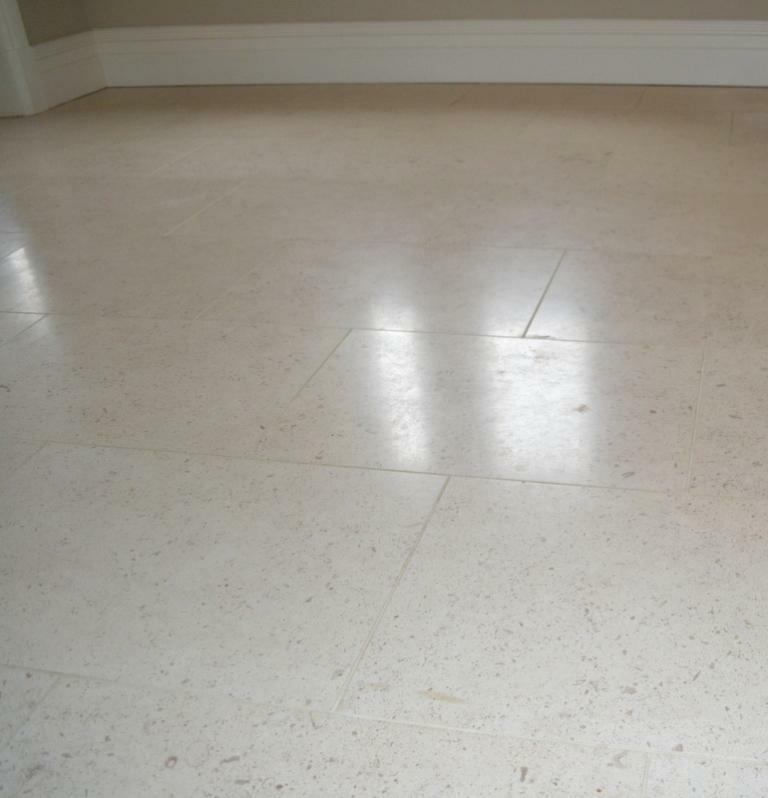 Bath Stone is a material that we don’t often encounter. 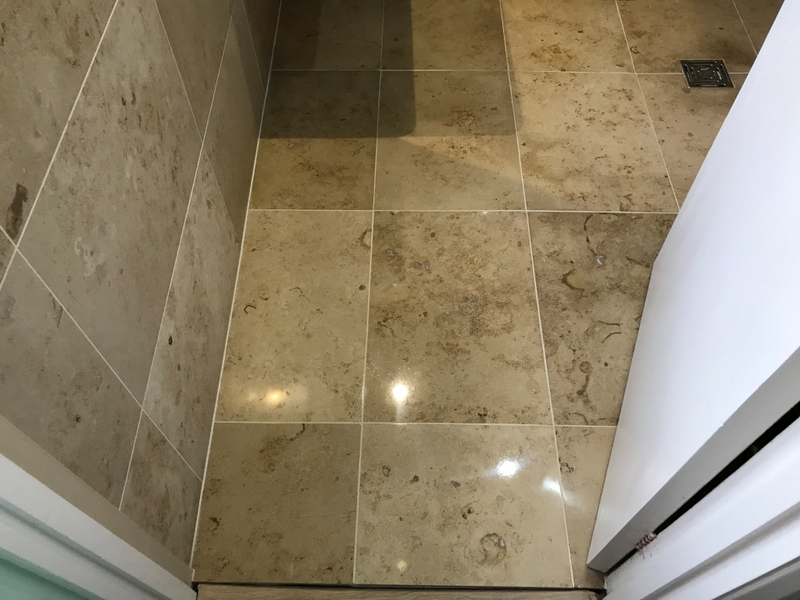 A variation of Limestone, its distinctive yellowish or ‘honey’ colouring is best associated with historical buildings in the City of Bath – hence the name ‘Bath Stone’. 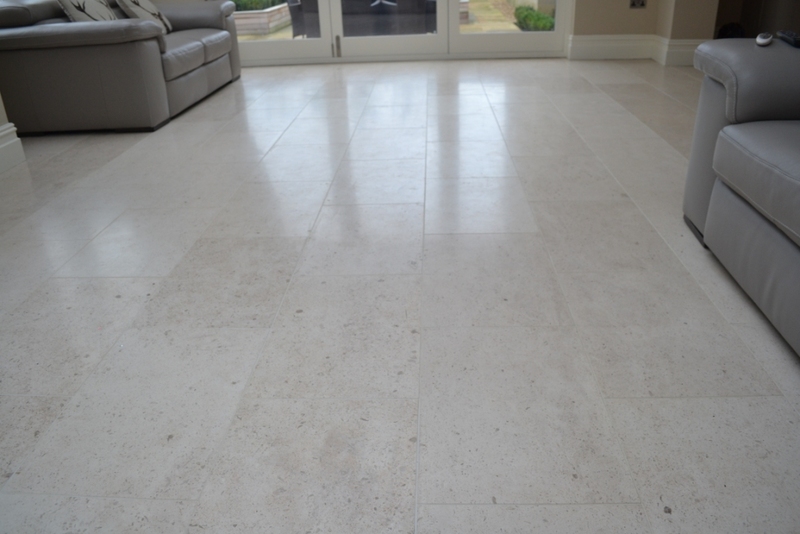 However, it has commonly been used as a building material throughout southern England and Wales. 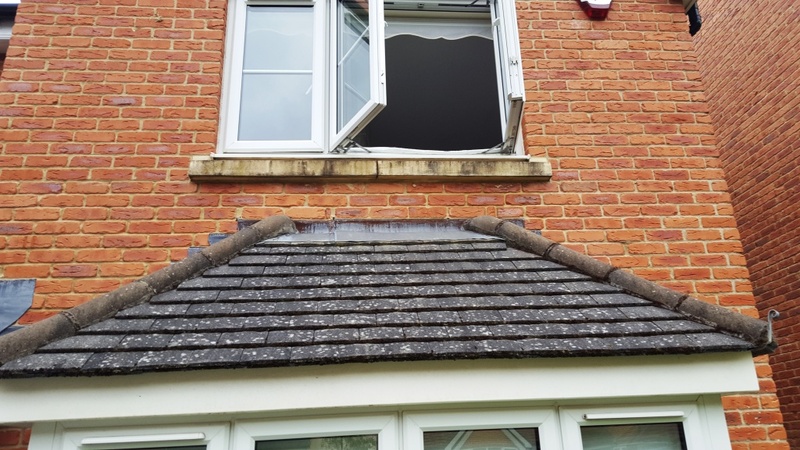 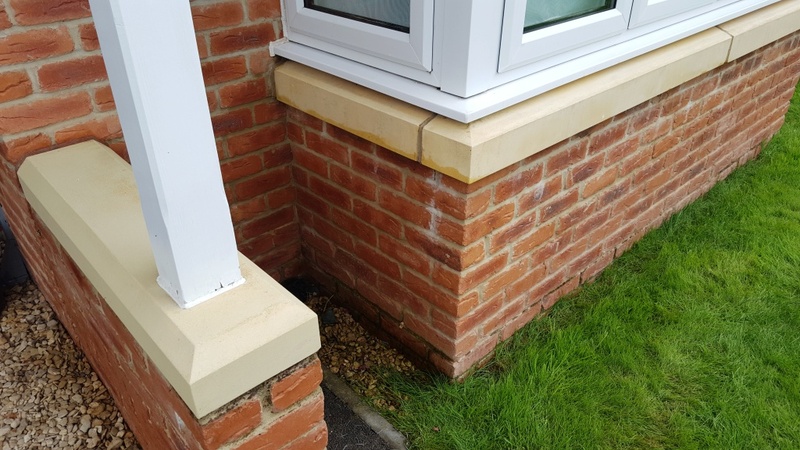 The owner of this property in Cardiff was quite upset that her Bath Stone window sills had become so unsightly over the four-year period since her house was built, so much so that she contacted Tile Doctor to see if we could help. 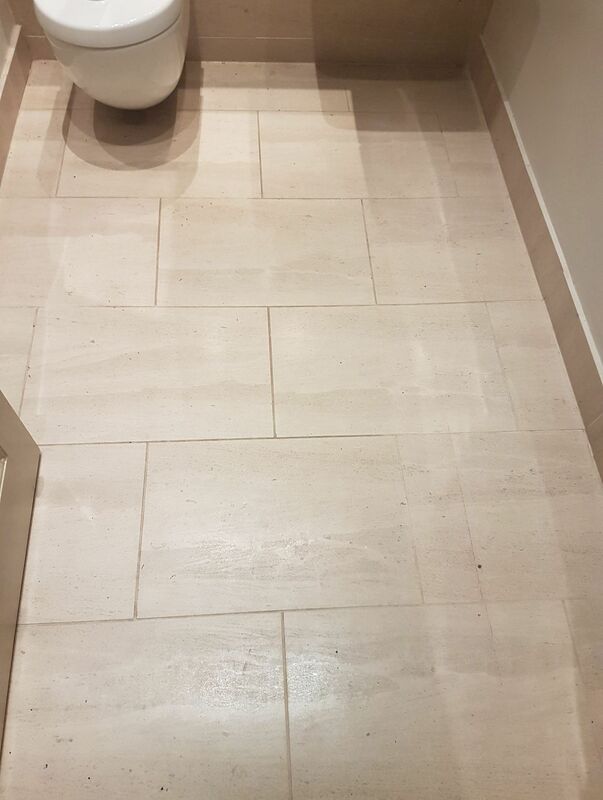 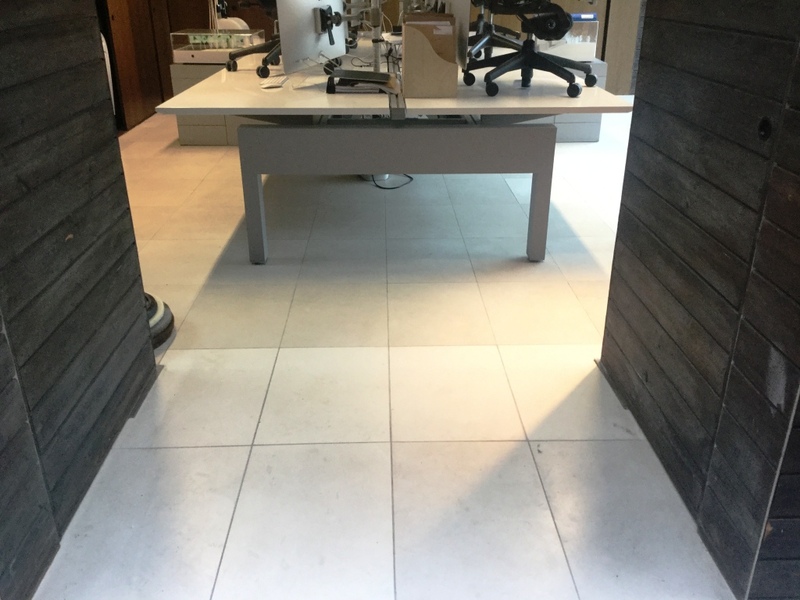 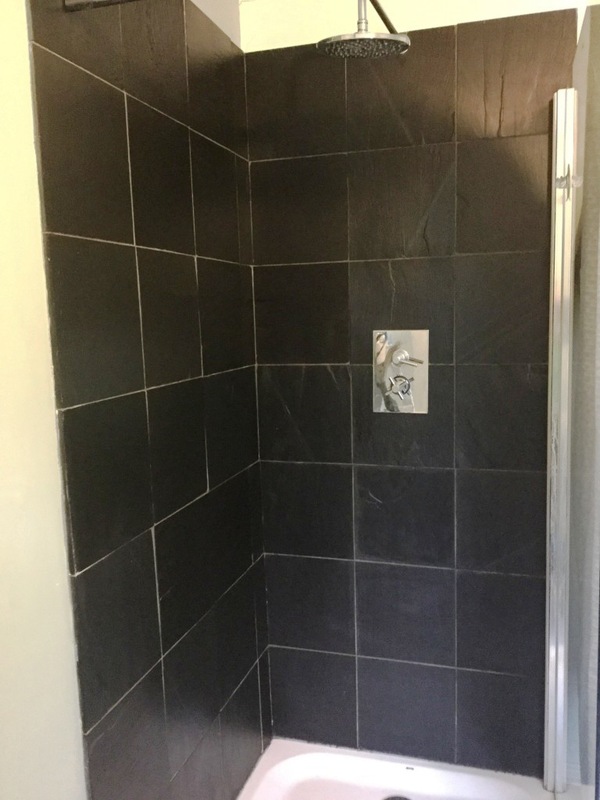 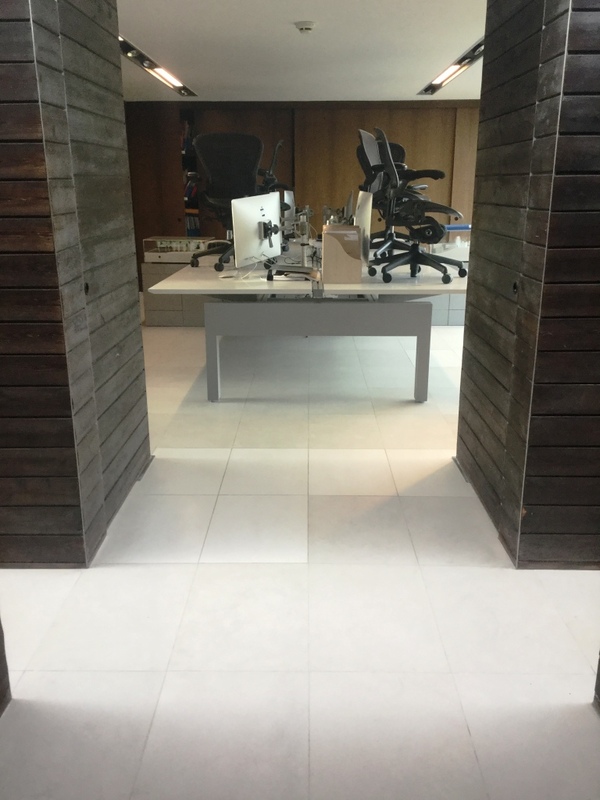 While at Tile Doctor we most often work on tiled floors, patios and shower cubicles, I was more than happy to assist in this situation. 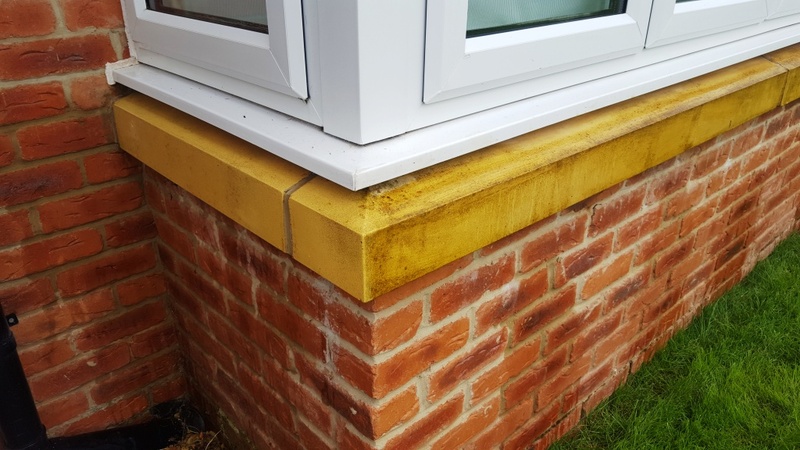 I popped round to the property to carry out some initial cleaning tests on an inconspicuous area of one of the window sills. 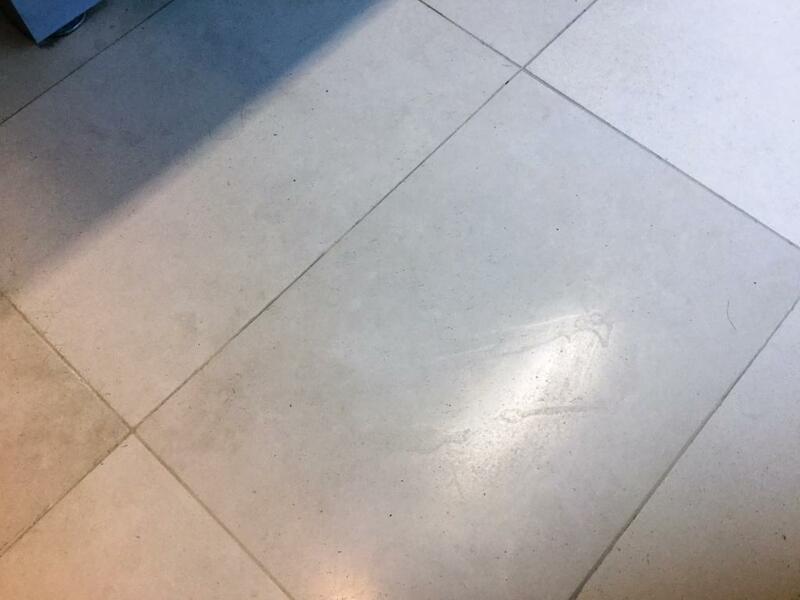 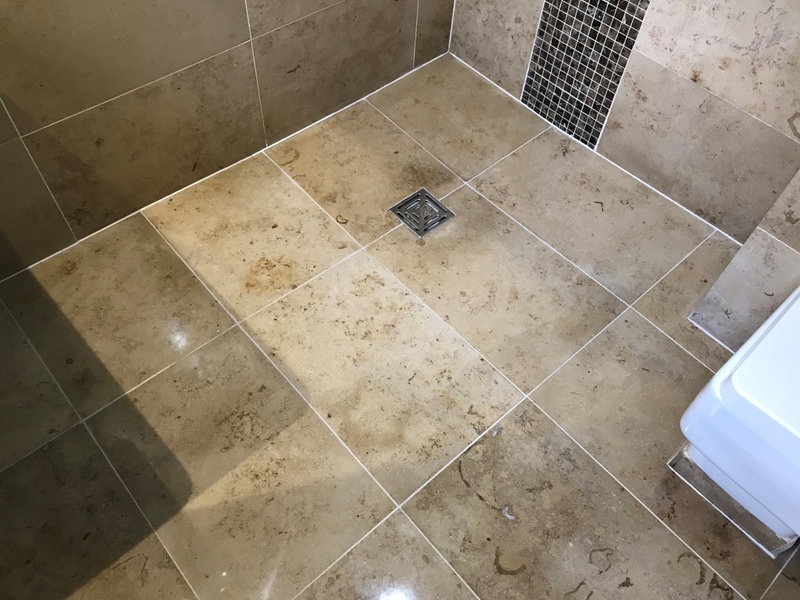 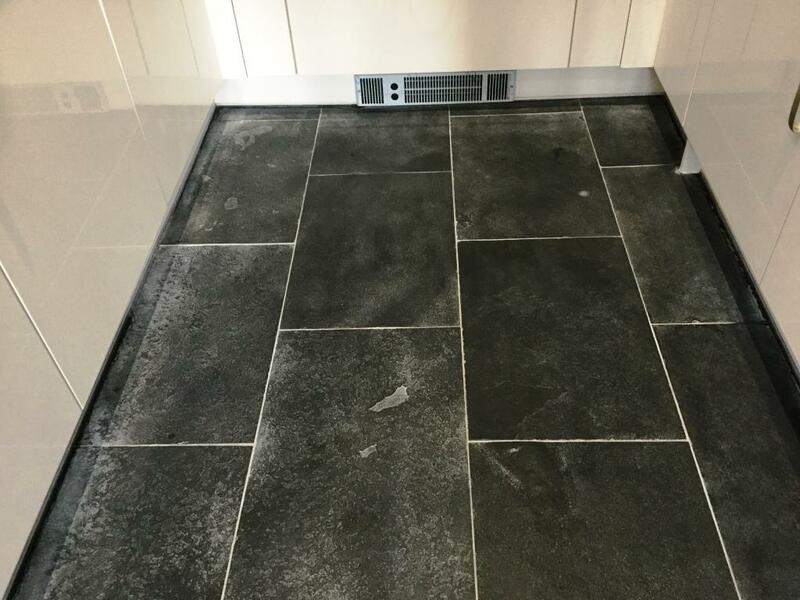 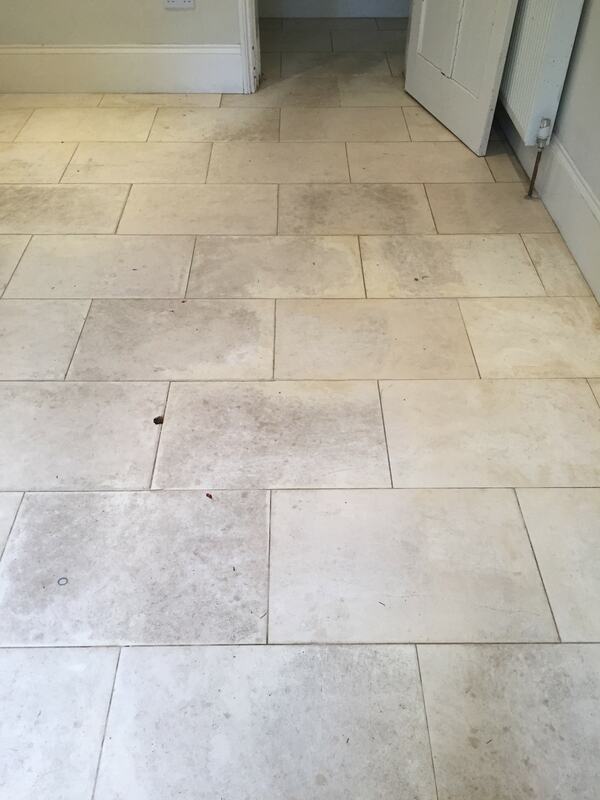 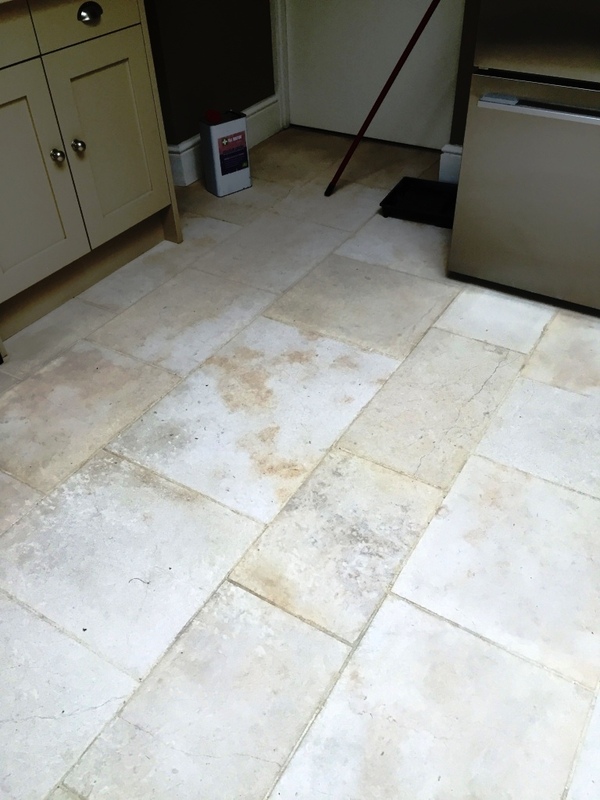 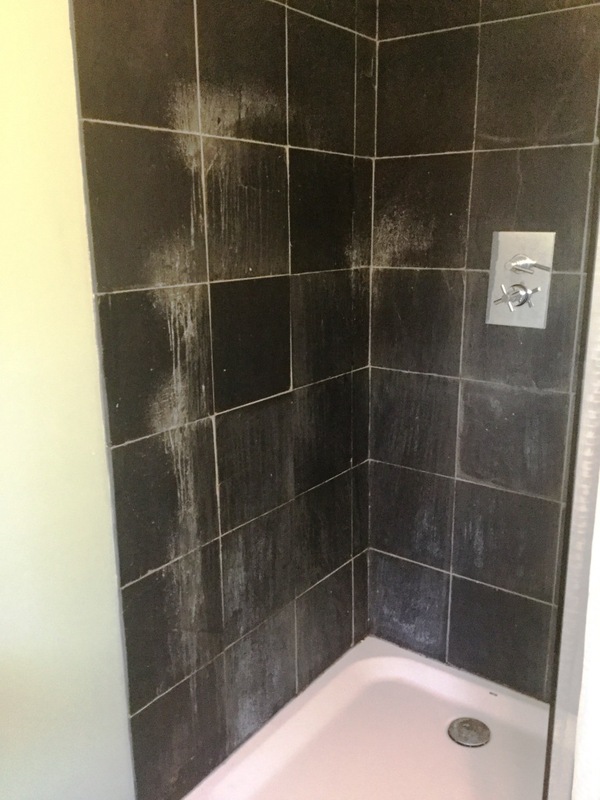 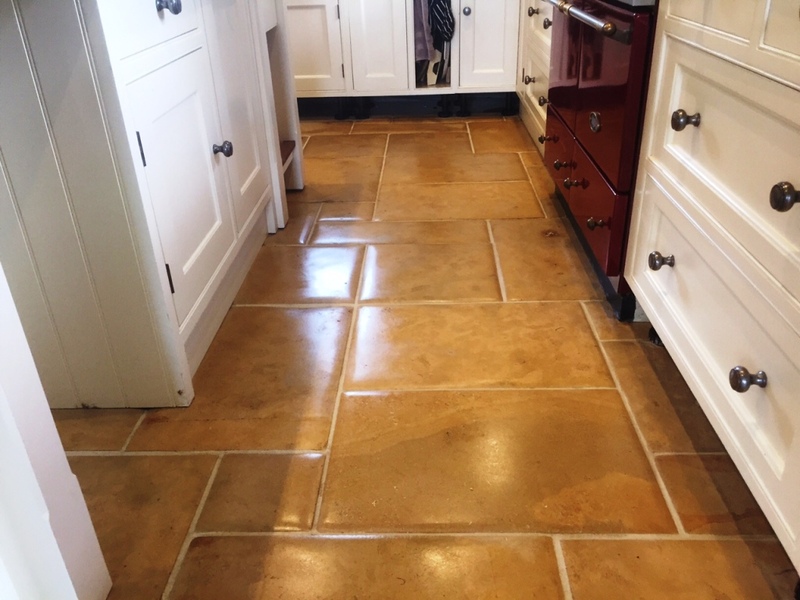 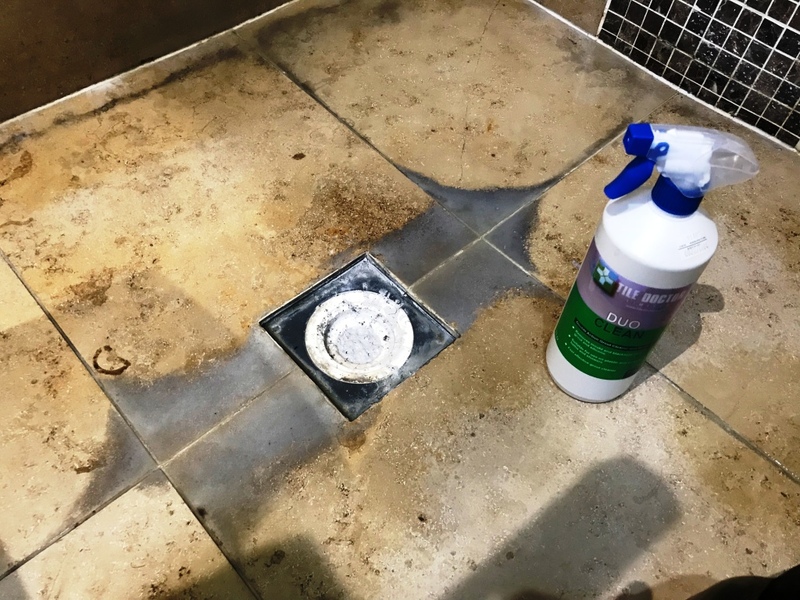 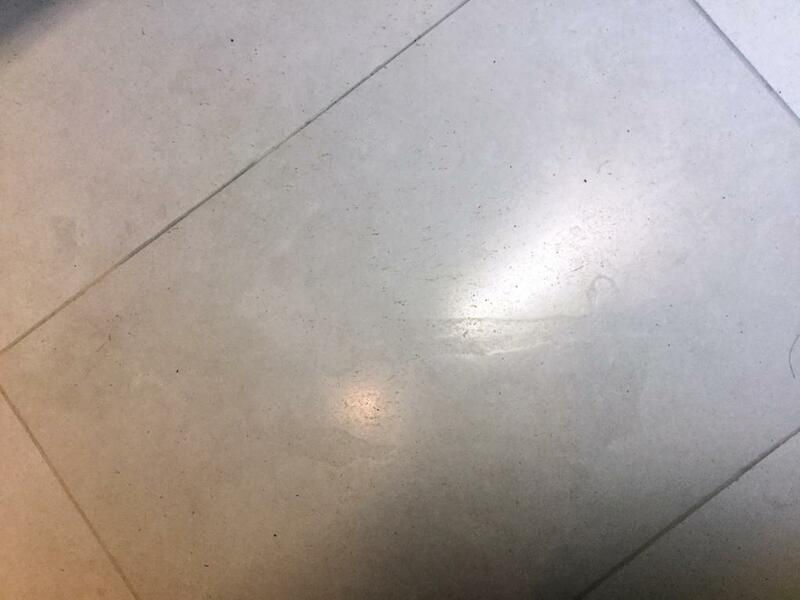 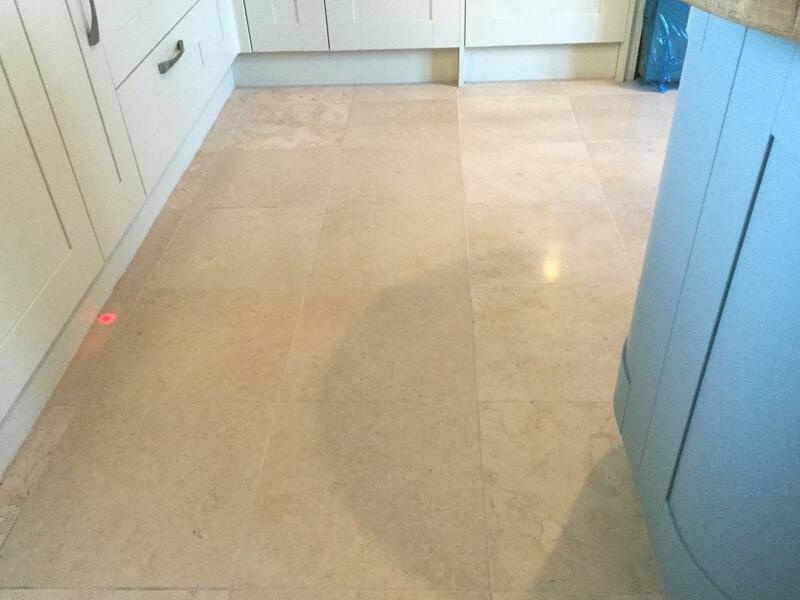 I applied Tile Doctor Pro Clean, which is our high alkaline cleaner, since it’s a very versatile and reliable product, and is suitable for use on most kinds of natural stone. 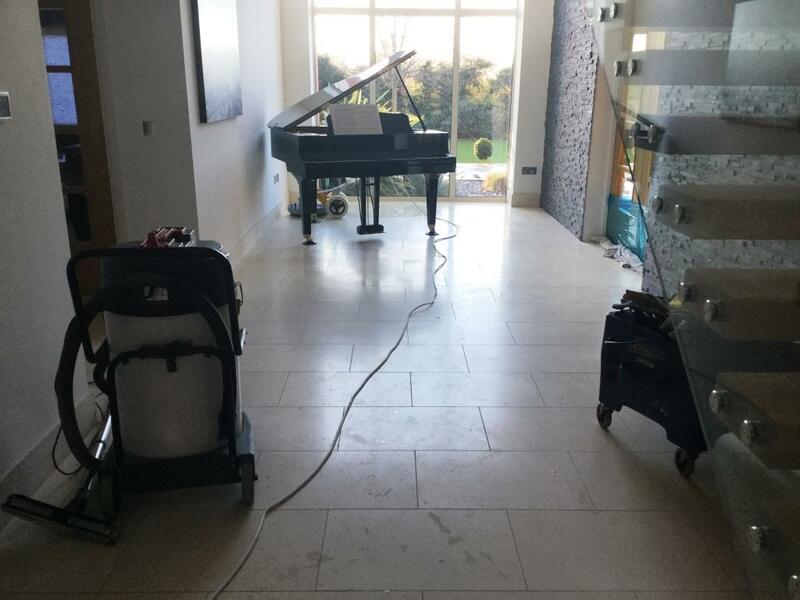 Some fantastic results were achieved quickly, with Pro Clean working efficiently to remove the green and black algae that I presumed came from the trees which were plentiful around the property. 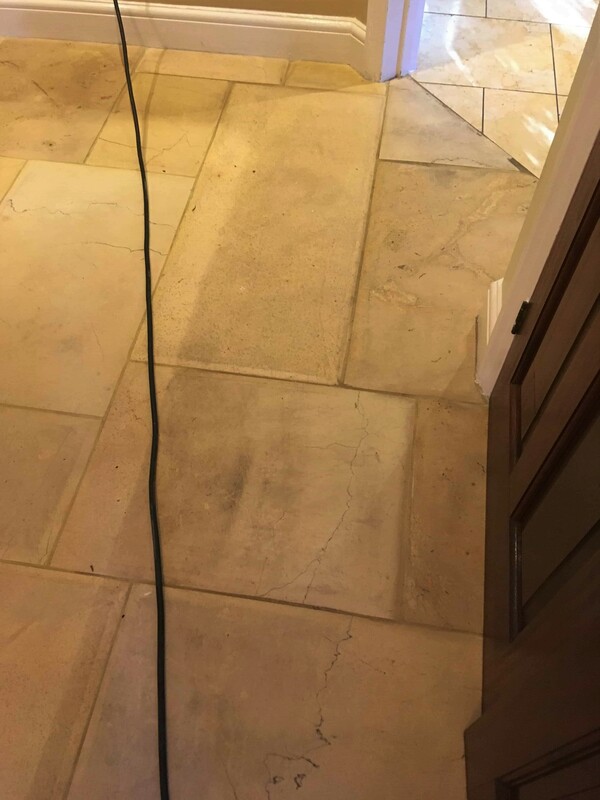 With the test clean a success, we agreed a date to complete the job. 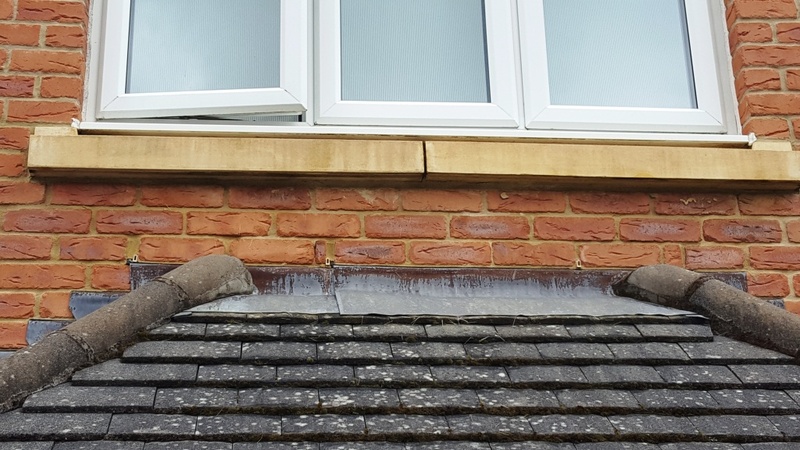 I returned on the agreed date with a ladder to treat the rest of the sills using Pro Clean, including the one on the first floor window. 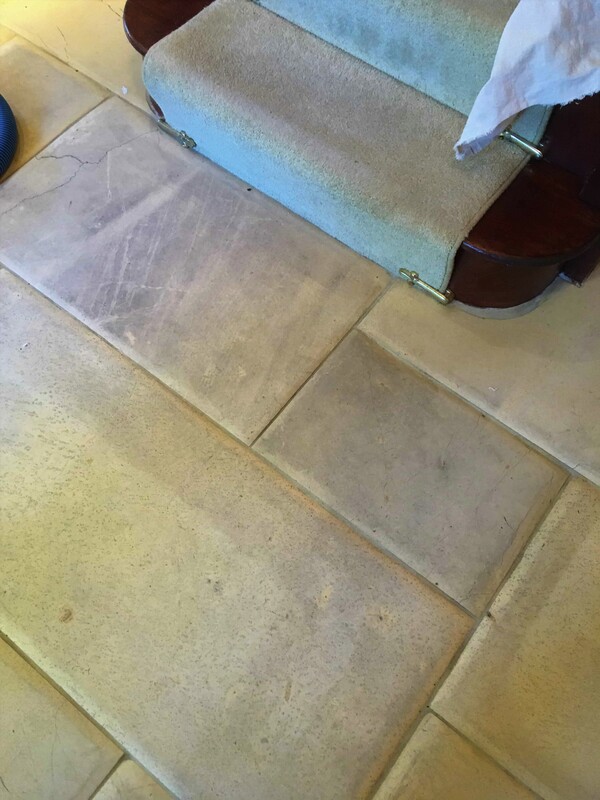 Before carrying out the work, I tested the stone for moisture and the readings were sky high. 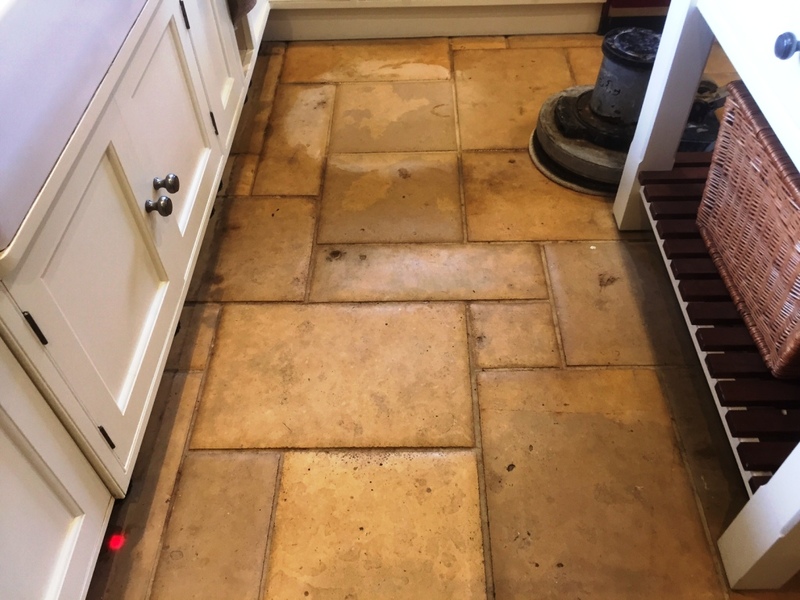 Therefore, I suggested to the customer not to seal the stone, but instead to maintain it using the same cleaning process as I had undertaken. 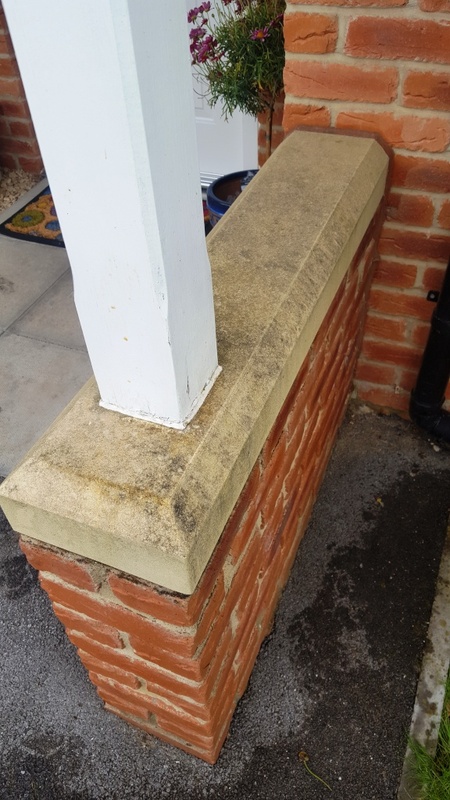 The outcome of my restoration was brilliant, so now when the customer feels that the sills need to be rejuvenated again, she can do so very easily.